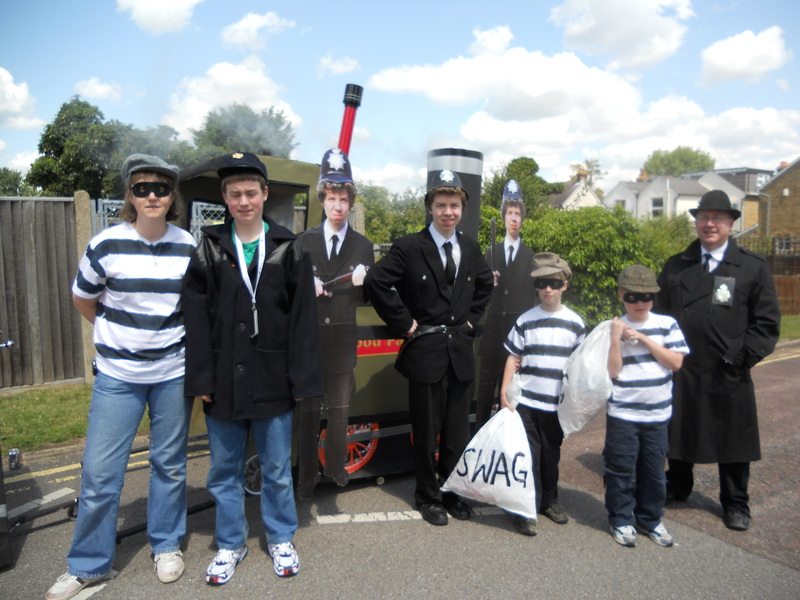 This year’s theme was ‘A Grand Day Out’. We did a ‘A Grand Summer Holi-Day out’… We built a double decker bus which was so sturdy and easy for Dan to steer… and we won the trophy again! 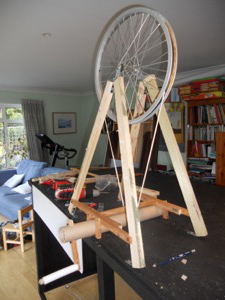 We had loads of comments from people wondering how it was propelled. The saw the bus, then saw the puppet in the driver’s seat, then saw the other puppet (operated by Josh) out of the upstairs window… but didn’t spot Dan steering it, looking out of the upstairs front window (he was hidden in the darkness!). We decided to go for ROBOT WARS… lifelong mega fans of the programme going back over 15 years, and delighted it is back on the screens. Decided to build two robots, to be piloted from the inside by Josh and Dan. Emma and Tim would be on the outside with remote controls, whilst I would have a microphone and powerful speaker on a backpack. WOODCHUCK was a heavy beast. It featured a powerful flipper, plus a cutting disc to the rear. It also had a smoke machine. They were both fairly easy to steer and caused a big commotion as we went past. A brilliant day – the weather was on our side and we had a great time! As usual, it was lovely to hear the enthusiasm from the crowds as we walked to 2.5 miles around the village. At first we were worried it wouldn’t get out of the back room but my measurements were spot on and out it went. 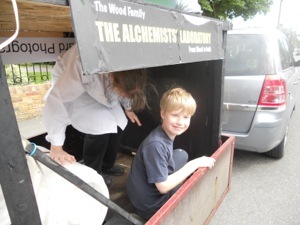 We did two trips to the assembly point with each section in the trailer – fitted beautifully! 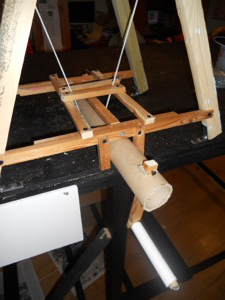 We joined the two together with my clever, albeit untested, rope coupling system and waited for the judging. Great to see all the walking and lorry floats assembling and we were eventually interviewed by the judges, and the local press. When I said ‘untested’, I should have actually tested it… the back half had a mind of its own and veered off to the left, dragging the back end of the front half with it. Poor Dan inside had a terrible struggle trying to keep it straight. Emma took over inside and last a few minutes… then over to me… NIGHTMARE! Fortunately we soon had a brief stop for the parade to catch up behind us (some of the lorries were huge and had problems going round corners. Welcome to my world!). I quickly cut the ropes, re-tied them and made it possible for Emma to pull the second row of houses, while I kept the houses stocked with powerful smoke bombs. 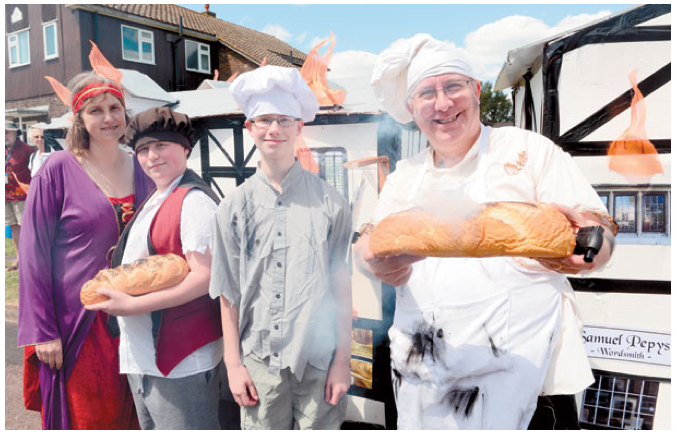 A hot, fun procession around the village followed, with so many of our friends in the village, and pupils at Emma’s school, shouting and waving as we passed… The smoke billowed; Josh had a burning loaf of bread and rang a bell shouting “FIRE!” as we went round at a steady pace. Saying that, we have chosen ‘The Great fire of London‘ – happy to reveal our theme, as the Carnival Programme is out any day now and the float themes are in it. The lack of interesting historic events can be seen by the fact that there are three with the same theme! 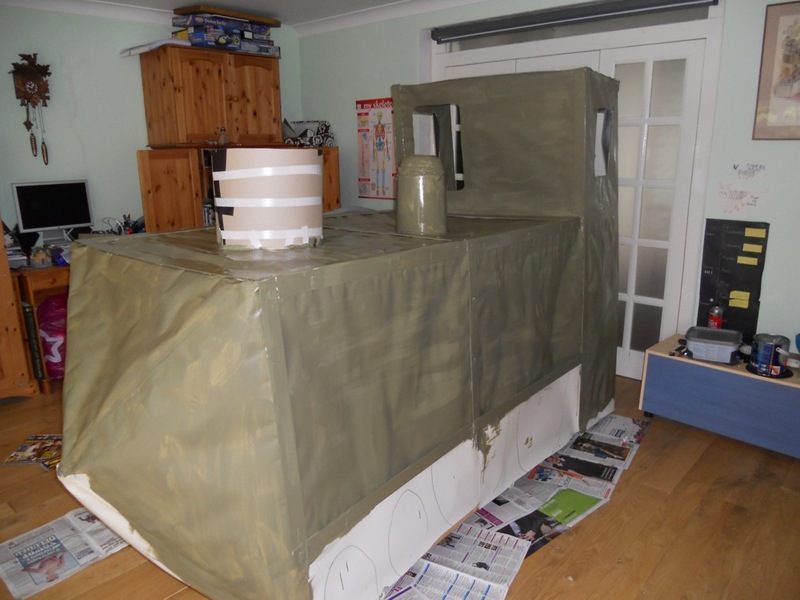 Needless to say ours will stand out… costumes just about sorted… only three of us visible this year, as Dan will be ‘inside’ pushing/steering the 16ft long float! 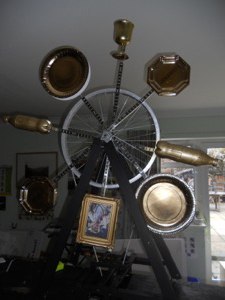 The whole thing, props etc. etc. etc. has cost about £80… I raised this in a most traumatic way recently – I was paid £95 to taste beers for a market research focus group one evening. Hic! 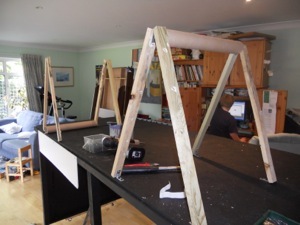 Building is under way… the theme for the carnival this year is ‘Fairy Tales’… sounds easy, but not when you’ve got to try and build something in your back room, that includes the whole family and is original! 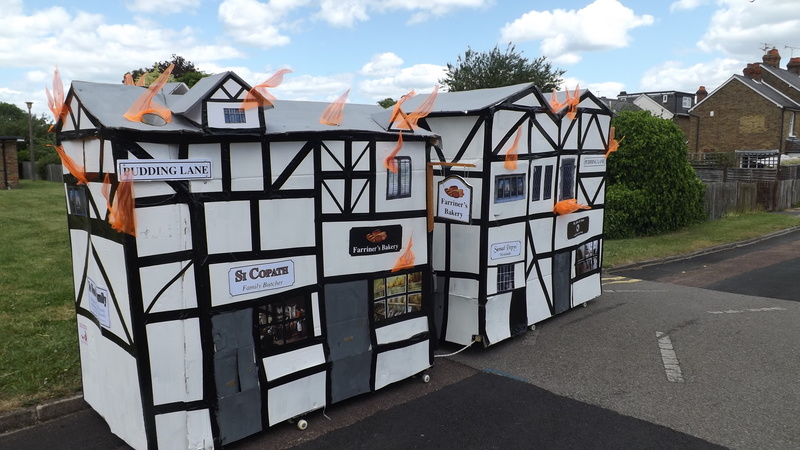 We’ve just heard that the company which normally provides lorries for the parade has pulled out, so that means up to eight village groups are trying to find other lorries or may join us as foot parties – it’ll still be great fun! The only problem is that our idea does involve me having a bare stomach… not sure if the village is ready for that. Wait and see on 7th June for what we’ve come up with! 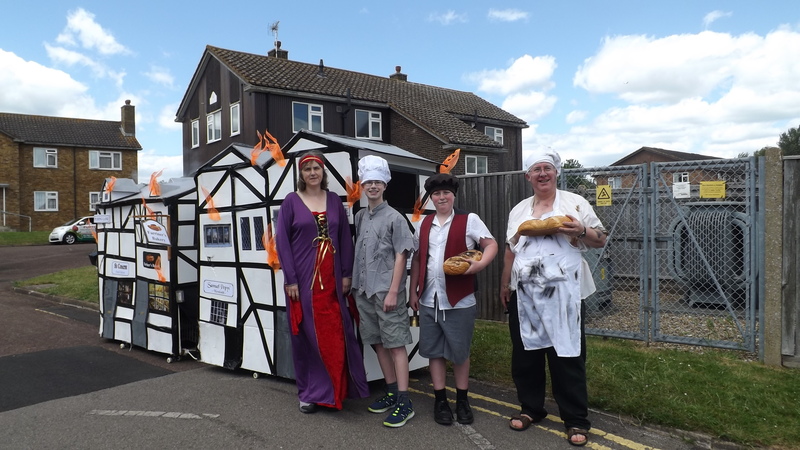 30 May update: Carnival programme is out now… we are down as entering with the theme of ‘ALADDIN’ – but what are we building…? JUNE 7th – CARNIVAL DAY! Despite terrible weather forecast, the sun came out at midday and shone all afternoon. Managed to get the float out through the house somehow and onto the trailer, then off to the starting point. The other floats were all brilliant again and the atmosphere was lovely… Our float stayed in one piece all the waty round, and the new 600watt sound system blasted out Aladdin music; Ollie kept his lamp smoking with his powerful smoke pellets; Emma was resplendent in her Princess Jasmine/belly dancer costume; I was the genie, but bottled out of painting myself blue (not enough blue paint). 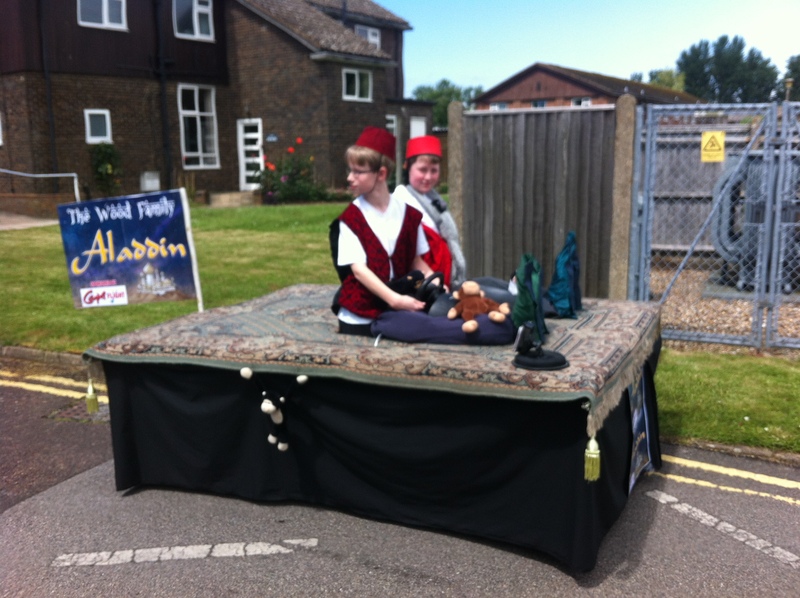 Stars were Josh and Dan who steered the magic carpet well (and baffled people who thought they really were sitting on it and wondered how it was driving along!) – it was like a complex three-legged race… being twins though, they were in perfect harmony! I didn’t update the blog as we built it this year, to avoid spoiling the surprise for villagers! 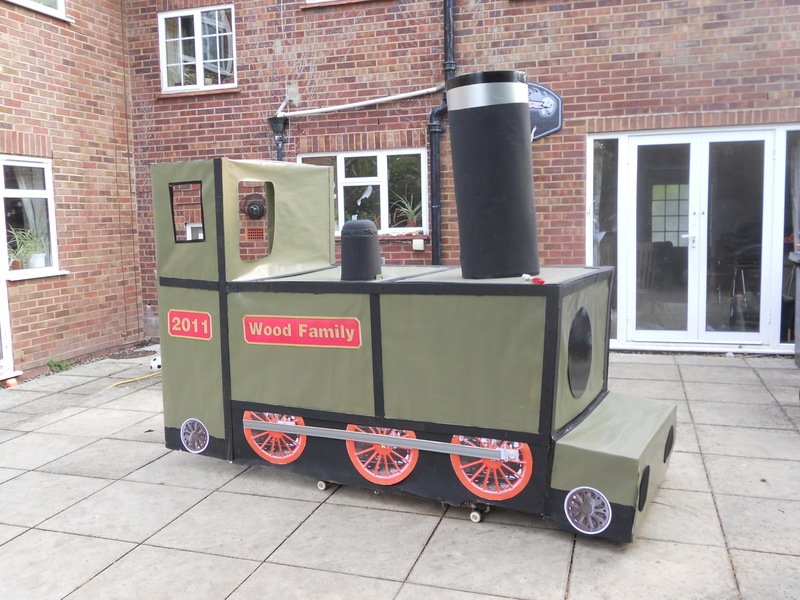 A new year and a new challenge to build a fun float with the family for the village carnival! Welcome to the 2011 WOOD FAMILY FLOAT blog. Time for us to don our thinking trousers and see what we can come up with. 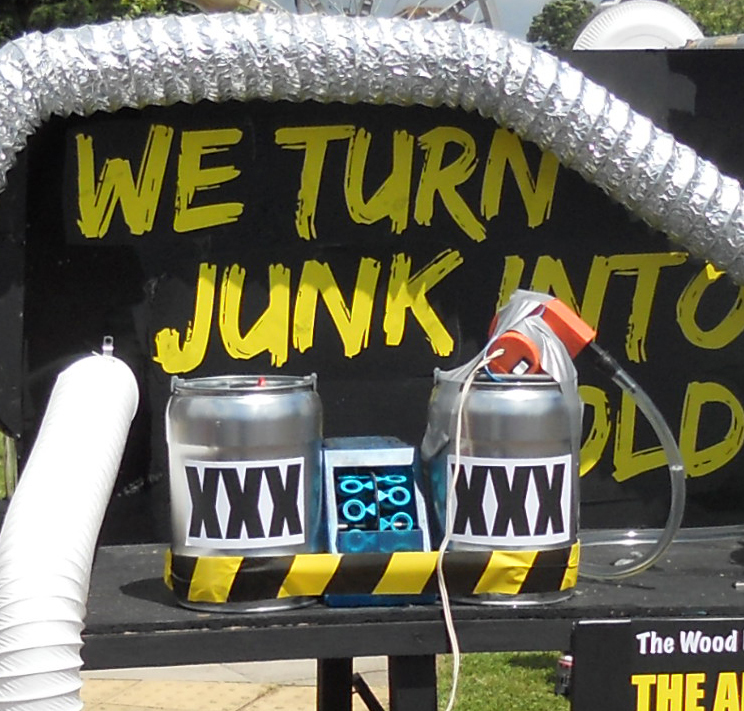 Keen on Wacky Races (Dastardly and Muttley, Penelope Pitstop etc…) – trouble is, will anyone under 30 know what this is? This would look very boring, so we’ve decided to expand it, use creative licence and be .Great Train Robberies. in general! (I did say ‘rough’.) Will also probably have a bit behind him for the coal… if I have time! Note the smoke – this is the main reason I want to build a steam train so I can get some effects. 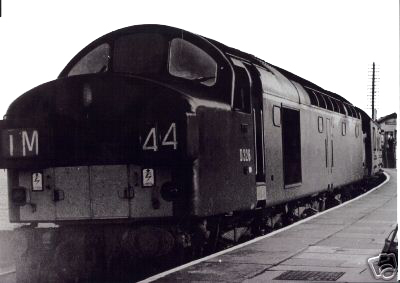 With a diesel train, I would be limited to dripping black sludge around the village and making nasty smells. Welcome to my world. The wheels above will be non-working ones – the skateboard wheels will be re-used from last year and there’s probably be a black skirt to hide them. Or not. Tim will be a policeman, with four life-size additional policemen pictures of him on a yoke, similar to the Sound of Music float idea, only better. Emma will probably be another robber, same costume as J&D, only possibly slightly larger size. Oliver will be the train driver. I will probably be a Police inspector with pork pie hat and long coat. Cleared up the back room and introduced the older baby chickens to their new home in the garden to give me a bit of space for building the train. Will need to move the heavy solid old base with wheels, and reconstruct the old bottom end of the Tardis, just to make is strong enough. Will go to the Resource Centre next Saturday to see if they’ve got any materials, such as the fabric I used to cover the Tardis, plus possible funnel materials… Must work out the pointy end so it is a rounded end – perhaps the resources centre has something… maybe a lid of a kids’ turtle sandpit…? Lovely sunny weekend, but managed to do a few bits on the train. During the week I covered the frame in thick white card (from a huge roll obtained free from the council’s Resource Centre). Added an mdf board across the top where the chimney will sit. Screwed a tin onto the boards, to hold the smoke pellets when I light them. 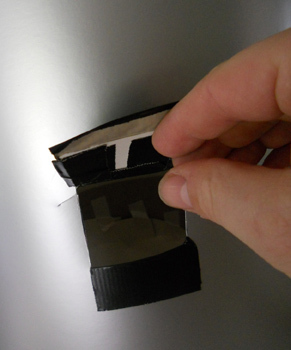 Since the tin is smaller than the chimney will be, I made a card funnel which is fixed to a sturdy card ring. 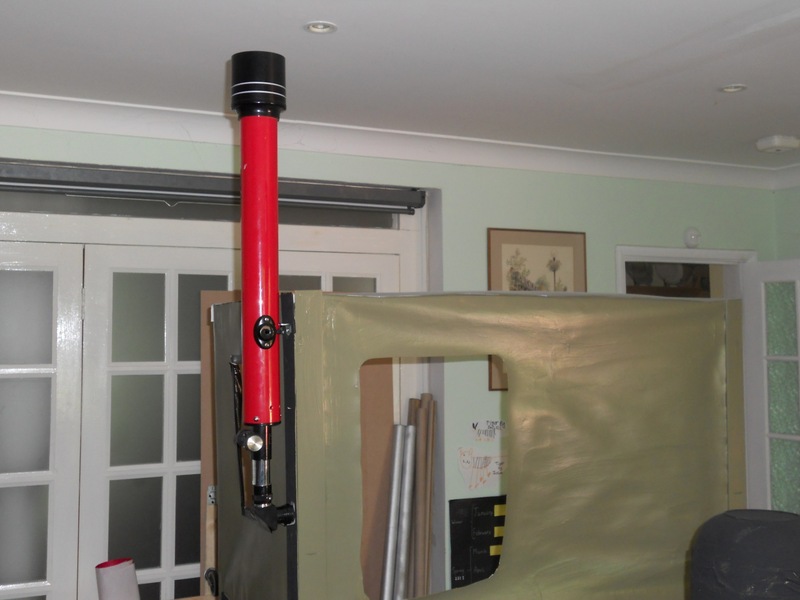 The chimney will slot over the ring – I cleverly spotted that when the chimney is on, it would get out of the back room, so it needs to be detatchable! 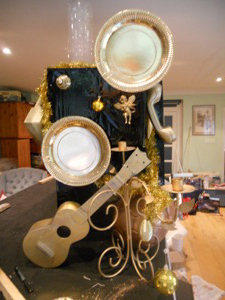 The Chimney was easy to make – the roll of card has silver printed onto one side, so the chimney is silver! 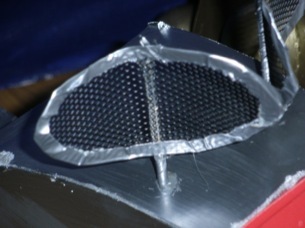 It slots over the inner ring perfectly and is very stable. I thoughtfully cut a window in the front of the driver’s cab so Oliver can see out, and around the chimney. I cut a slot and created a closeable flap at the side into which I can pop the lit smoke pellets. An added bonus is that he shouldn’t be blinded by smoke as the chminey is quite high up. The secondary bulge thing seems to be a feature on steam trains and was made using an old waste bin with a mixing bowl on top. Hope the paint sticks to it. Started to add strips to cover the joins. These a thin mdf wooden slats from an office blind I think – again, supplied free from the Resource Centre. 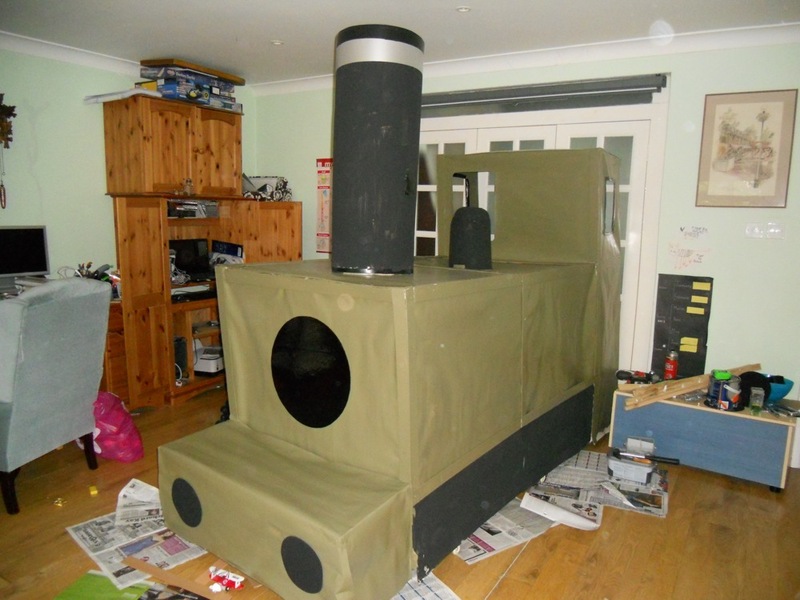 Got a large tin of yucky green paint from there too which will cover everything except the chimney. Mind you, it’s 2.5 litres and a bespoke colour – if it runs out before it’s all painted I’m scuppered! I know that most steam trains have rounded tanks but this was too tricky to do in the time and funding available… besides, simple research shows two real engines are just like my one! 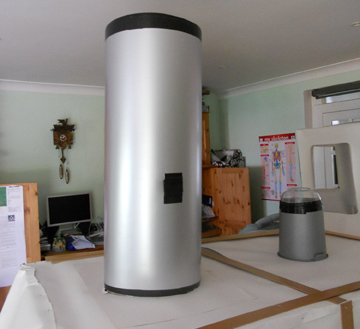 If I get hold of some black paint, I’ll probably paint the chimney, leaving silver rings at top. 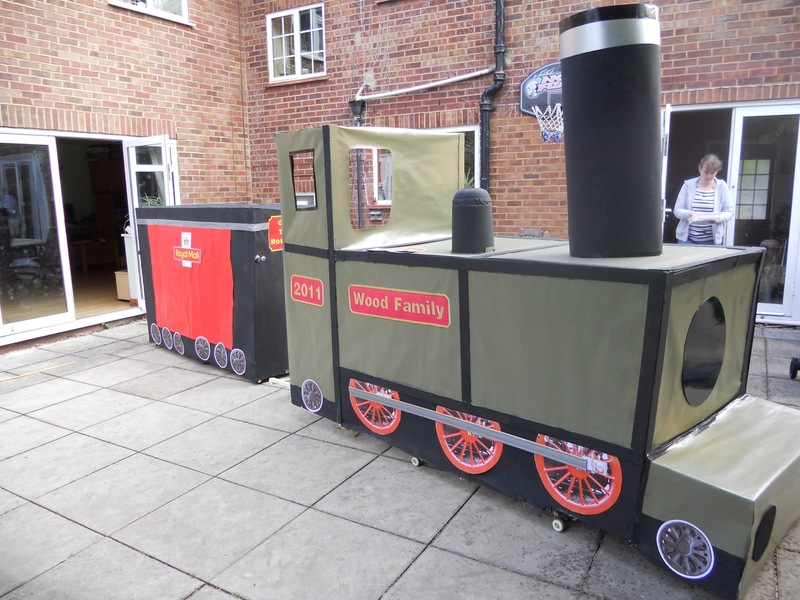 I will then need to build a small Royal Mail carriage for the train to pull. This will be interesting as I’ll need to find some wheels. I’ve got my eye on a wooden base with castors that’s been stuffed behind a Windsor shop’s rubbish bins for the past couple of months. Now, do I try and find which shop they belong to and ask to have it or just assume it is are rubbish and liberate it? Used my lovely waterproof paint from the Resource Centre (2.5 litres,) to paint the bodywork. The colour is just right – a sort of murky, sooty green. Trouble is, the front end does rather resemble the top of a Tardis that’s been turned on its side. Painted the chimney black and left a silver ring around the top… looks really good I think… also painted the bobbly round thing behind it. And the floor, much to Emma’s well-disguised delight. Decided it needed the round shiny black front door thing, so used some black Fablon stuff (Resource Centre freebie again), stuck onto card. Painted the underskirt ready for fixing the wheels and metallic tubing things on (a battle yet to come). Then added a sticky-out thing on the front and two buffers (round black mousemats from the Resource Centre). I will mount flags on this saying what our theme is. 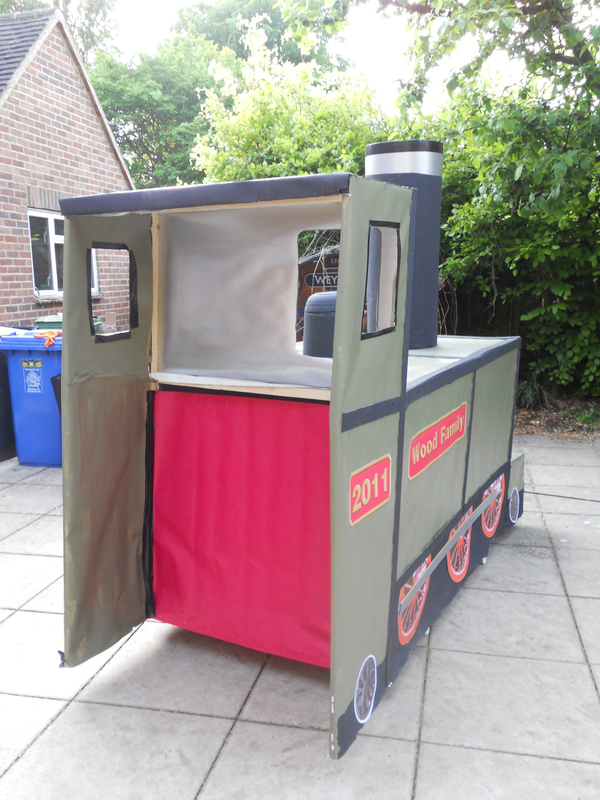 Easter week coming up… Plan to order the smoke pellets (just sold some rubbish on Ebay so have £45 in the float building kitty! ); hopefully attach signage; sort out the wheels if possible. 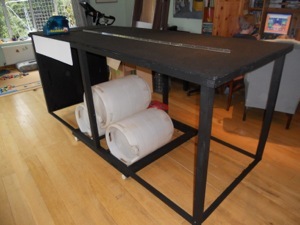 Busy family weekend, but managed to squeeze in some floatwork… Started off with liberating a wooden base with castors from by the bins at the back of a shop in Windsor. It’s been there since before Christmas as the binmen wouldn’t take it. So I did. 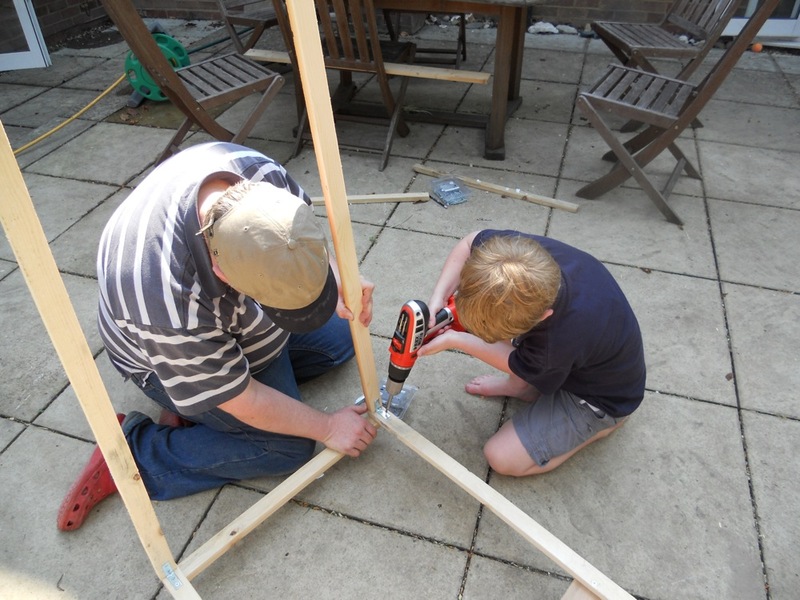 Joshua helped me screw a wooden frame to it, to become the Royal Mail carriage. 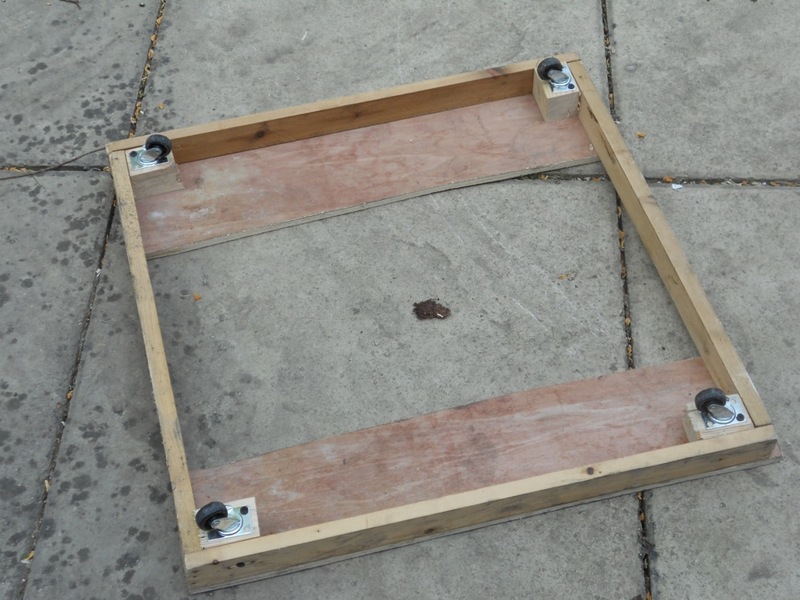 This was covered with more card from the roll… Moved the castors to the four corners to aid stability. 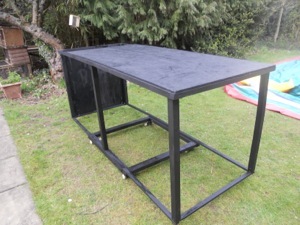 Daniel then helped to paint it black. 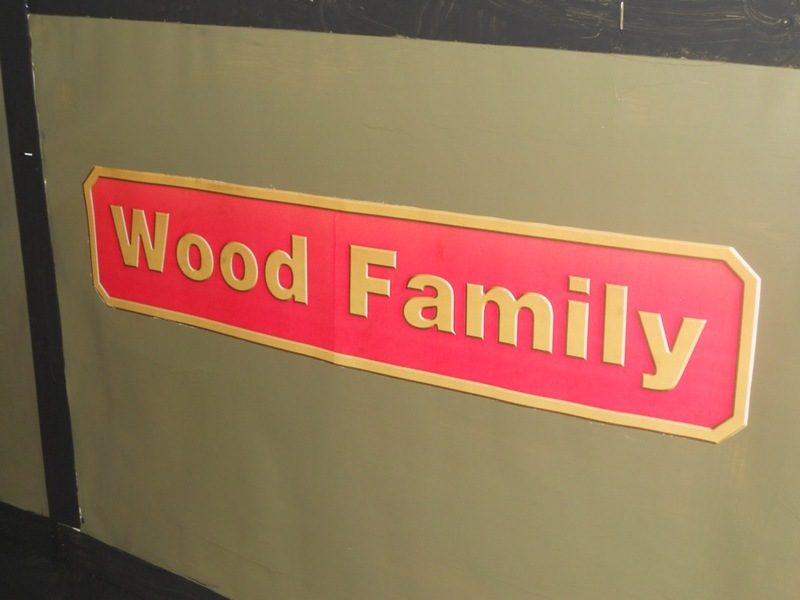 Back to the engine… Added some signage… looks 3D and metallic – the joy of Photoshop! After enjoying the fabulous spectacle of the Royal Wedding, plus a generally busy weekend, I managed to sort out those wheels which look okay! I found a good picture of a steam engine and edited down the wheel and printed out six of them. 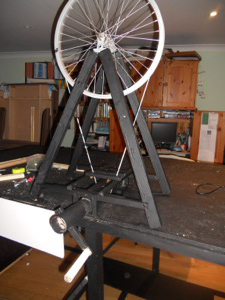 Also printed out loads of smaller wheels for the carriage and the front/back bits of the train. The smoke pellets arrived so I tried out my lighting device and tested the chimney – worked well. I’d prefer thicker smoke but don’t think I can find more powerful smoke without affecting the spectators! Decided against having a sound system this year. No obvious music and SFX of trains are pretty inaudible and would be unrecognisable over the clatter of our wheels on the tarmac. 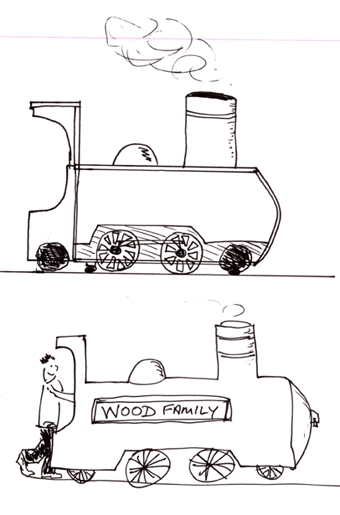 Will arm Oliver with a wooden train whistle instead. Bank Holiday Monday… it’s all happening in the world, with the news that Osama Bin Laden has been killed. Surprised me a bit as I didn’t think they took the Bins out on a Bank Holiday. 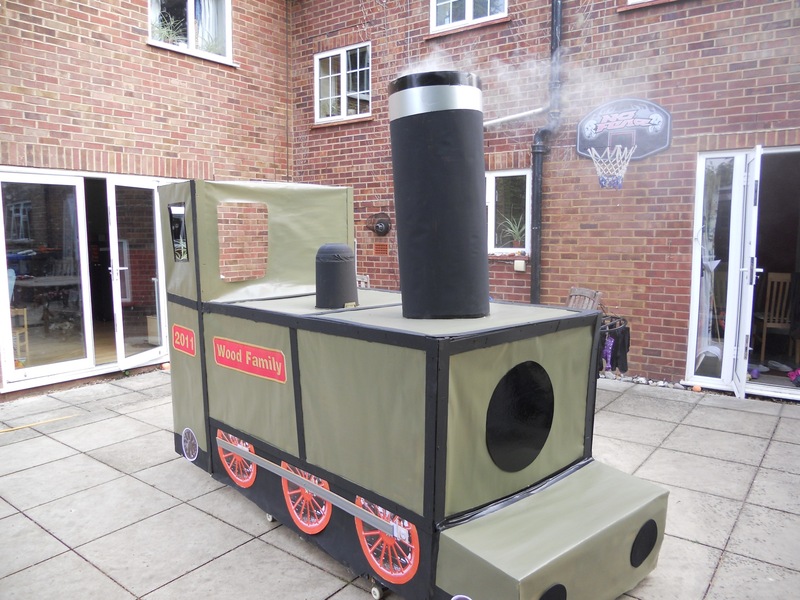 Assembled the carriage and train outside. Looks lovely. Emma also said it was brilliant, although I suspect she was referring to the fact that our back room was now empty. Decided the view from the back, whilst largely obscured, looks rubbish. 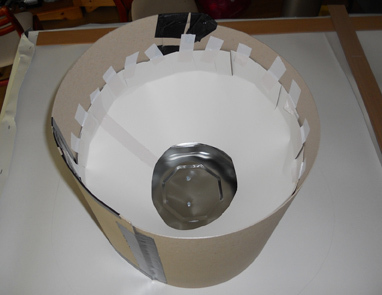 …so put a sheet of reddish Resource Centre paper across the hole. Decided the cab needed one of those steam whistle chimney things, so attached one to it. Looks authentic. Unless you’re a wife, in which case “why did you stick a telescope on the cab?” is the comment. I still think it looks right, so do the boys. Telescope was rescued from the Resource Centre of course. Popped two flags saying ‘Great Train Robberies’ on the front (using two St George’s Day flag mounts bought for 5p each after we lost some footie match a year or two ago). This will hopefully explain to watchers why there’s a steam train in a carnival parade about Heroes and Villains. Used the brilliant http://www.blockposters.com to create large-scale versions which I printed out and glued (using spray-on carpet adhesive). 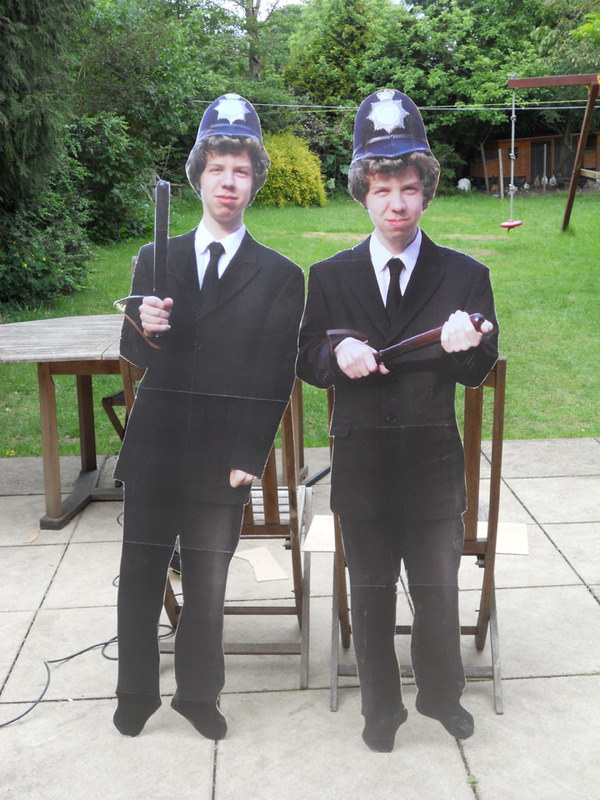 Then, a quick bit of jigsawing and I’ve got two life-size Tims… each as lovely as the original, and just as hairy. I had taken rear-view pics too, but quickly realised how impossibly it would be to position these exactly! Then realised that from the back it was all virtually solid black anyway, so after mounting the boards onto a wooden cross beam (to be affixed to Tim’s belt on the day), I will simply paint it all black! Train all done; Tims all done just about; just got to do our costumes. 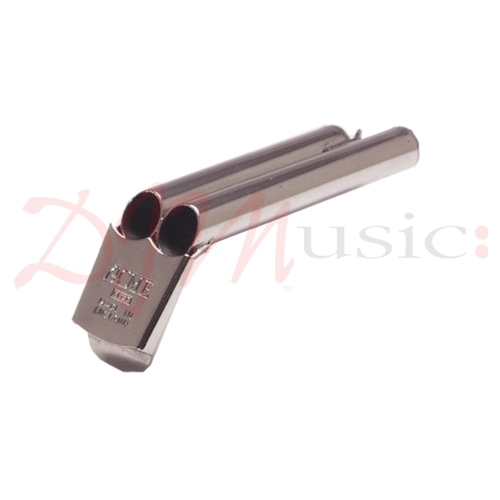 I ordered a Steam Train Whistle off some musical website (www.djmusic.com) – hope it arrives. Sounds great – louder and better than toy wooden ones. Listen to it here: http://www.djmmusic.com/mmDJM/Images/whistles/2_tone_143.mp3 – it’ll give Oliver something to do when he’s not negotiating the leaves on the line. Found a new source of mega-lasting high density smoke capsules… may invest in some, with the proceeds from the roof-box we sold on eBay! Got some fantastic new smoke pellets… last for 60 seconds and give off 5 times the volume of smoke – can’t wait to show it off! Ollie: Train driver… Found my genuine British Rail train driver’s hat, complete with brass badge from when I collected this sort of thing. Also found my donkey jacket which completes his outfit. He’ll be steering the train and blowing the brilliant Acme Train whistle so will be very busy. Tim: Policemen… Currently bidding on some silver police buttons to replace back ones on a good black jacket of my dad’s I found in the loft. Sorted out some epaulettes as well. He’ll look great! Robbers… Found three white t-shirts for Emma, Joshua and Daniel) in the loft and used black fabric dye to paint horizontal stripes on back and front. These look perfect! Also got 3 flat caps from my hat collection for them to wear. Made three black fabric masks, mounted on card for rigidity. Just got to add elastic and their costumes are sorted. Detective (me)… Got my long black smart raincoat and borrowing Tim’s new Fedora. Easy really. Two weeks to go… just about ready for action! Received the Carnival programme and see we’re duly entered as a Family Float correctly. Record number of floats this year which is great, as it was tailing off a bit recently. Checked weather forecast and seems like the rain is not going to appear! Watch this space for more news later this morning or after the carnival… or I’ll pop some pics on my Facebook page from the carnival itself. 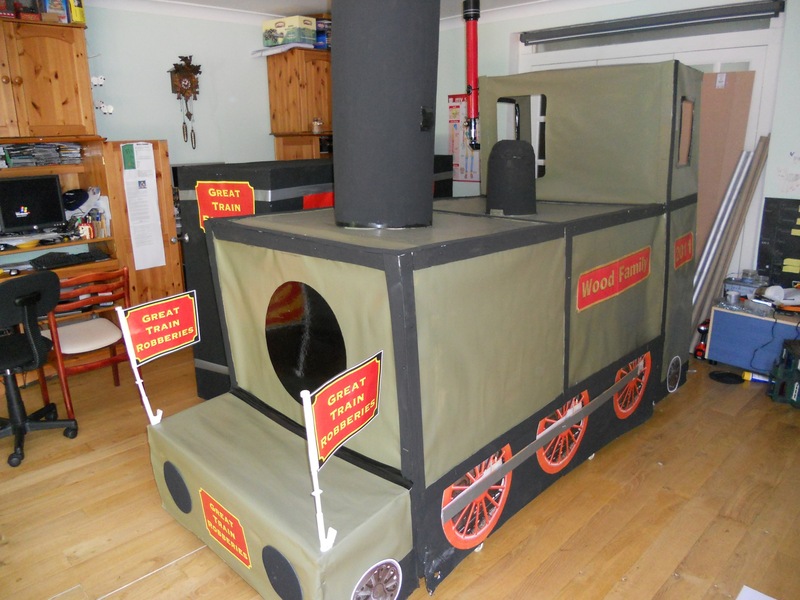 Managed to get the train out of the house, with only a bit of furniture removal, and it fitted in the trailer just fine. Dropped it and the in-laws at the start point and went home to collect the carriage and the boys. Shoved Emma in the trailer to stop the carriage falling over. Got lots of strange glances en route… but, hay, it’s carnival day so everywhere’s full of strange people in strange outfits doing strange things. 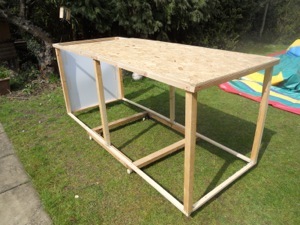 Assembled everying with no hiccups, and had packed lunch while everybody else arrived on their lorries etc. Great fun seeing all our friends on their various floats. 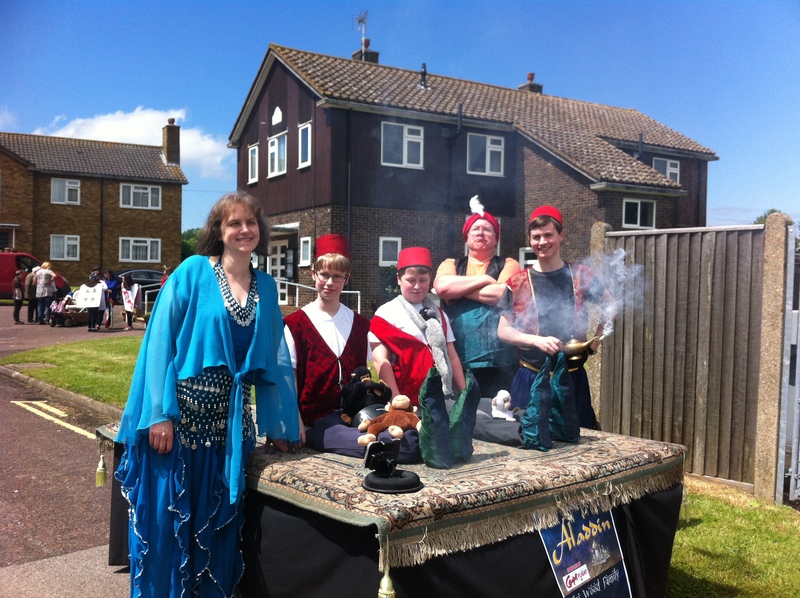 Great procession – weather beautiful and a fantastic array of floats from all of the village organisations, schools etc. 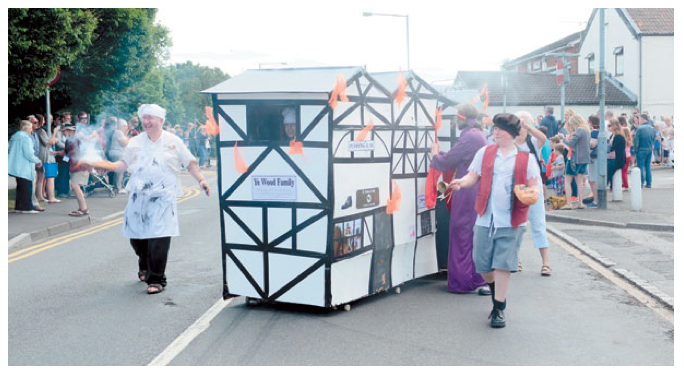 Our float drew lots of attention, especially the smoke. 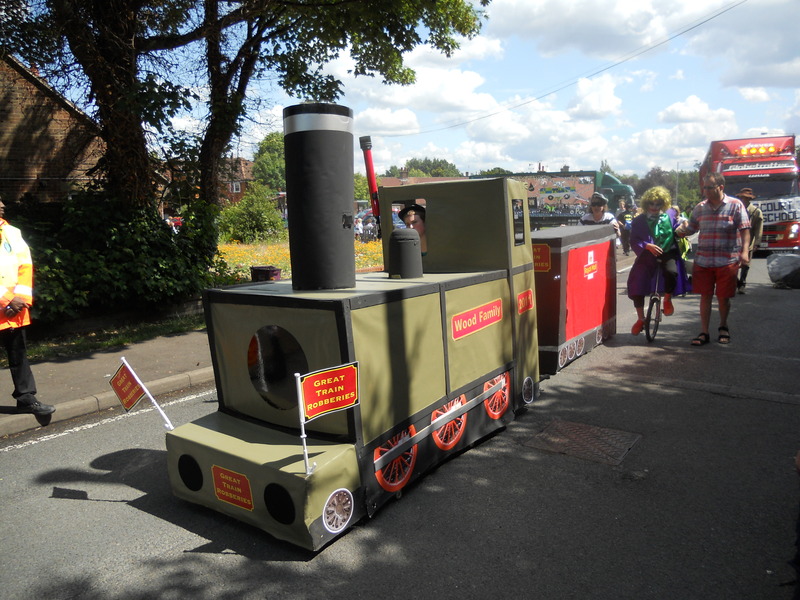 One old chap tottered up to us before the start and said “you’ve even managed to get it smelling like a steam train!” Our friendly local MP and family were most impressed, and his children loved the smoke and couldn’t believe that a steam train was going to be driving along the road! J&D joined in the official collectors and got spectators to drop money into their swag bags… I would then race after them and tell the spectators off for giving their cash to robbers! Most of them saw the joke. Yes, J&D Did give the money in at the end! Oliver did brilliantly driving the train – Emma had to help steer the carriage, as the wheels must’ve come from a Sainsbury’s trolley as they seemed to have a mind of their own. When we passed the Post Office, the staff saw the Roayal Mail carriage, got very excited and rushed over and got us to stop for a photograph of them in front of it! Hopefully it was as a bit of fun, rather than an nimpending copyright infringement lawsuit. 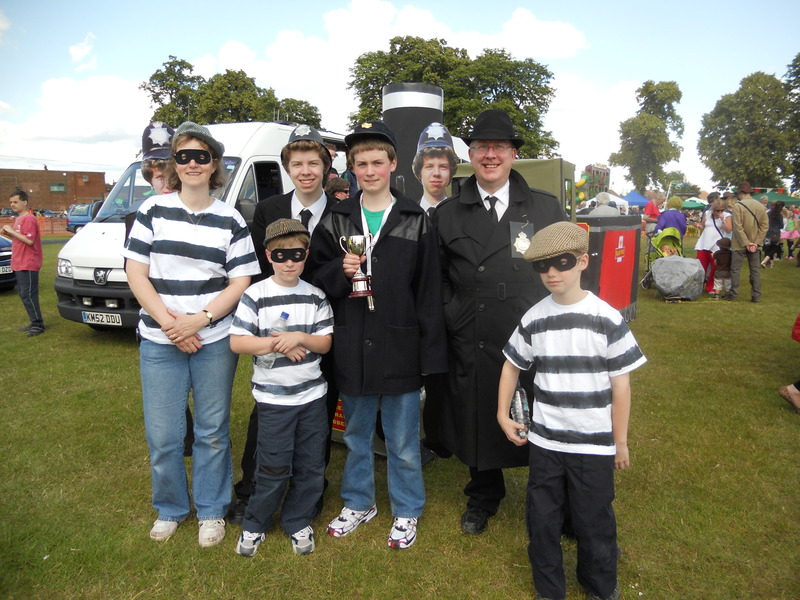 Here’s a few pics of the event… ending with the one of us WINNING THE FAMILY TROPHY for the third year running (or walking!). Nice to be presented with the trophy by our Neice, Helen, who was Carnival Queen’s Attendant (Deputy Carnival Queen really). Emma’s pedometer at the end of the day said she’d walked 9 miles! Wandered around the stalls etc then off home for birthday tea for Joshua and Daniel with family (My sister and her hubby came to join us)… then the six of us went later to the Harvester down the road for birthday dinner… Lovely ending for a lovely, tiring, day. Welcome to the 2010 WOOD FAMILY FLOAT blog. 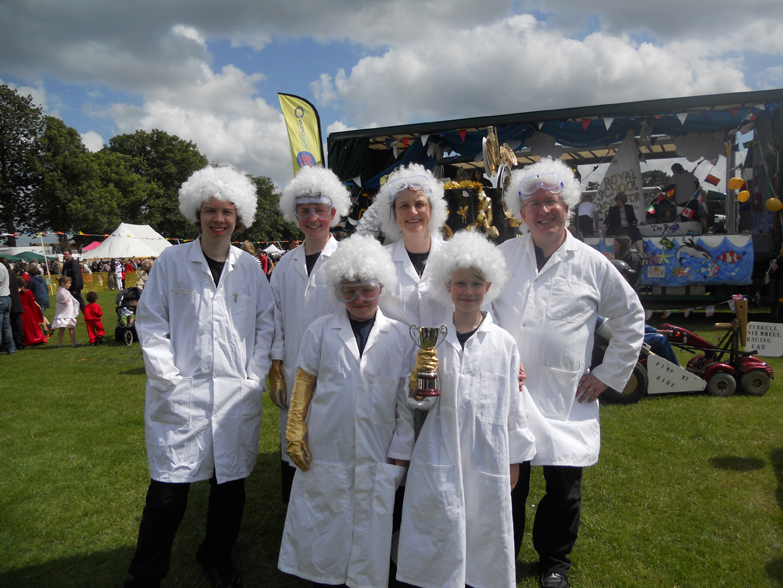 Right – we’ve decided on our theme and have registered our idea with the carnival organisers. 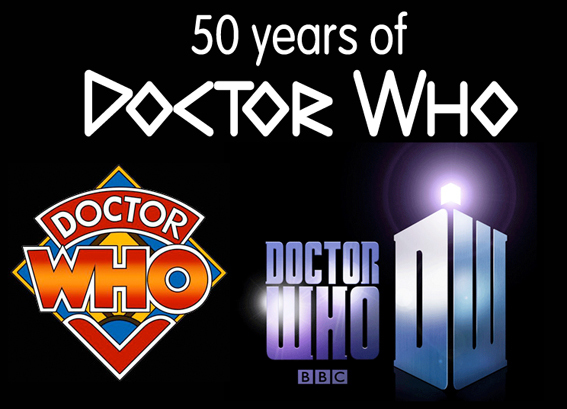 We all love the Dr Who stories and this gives us lots of scope. 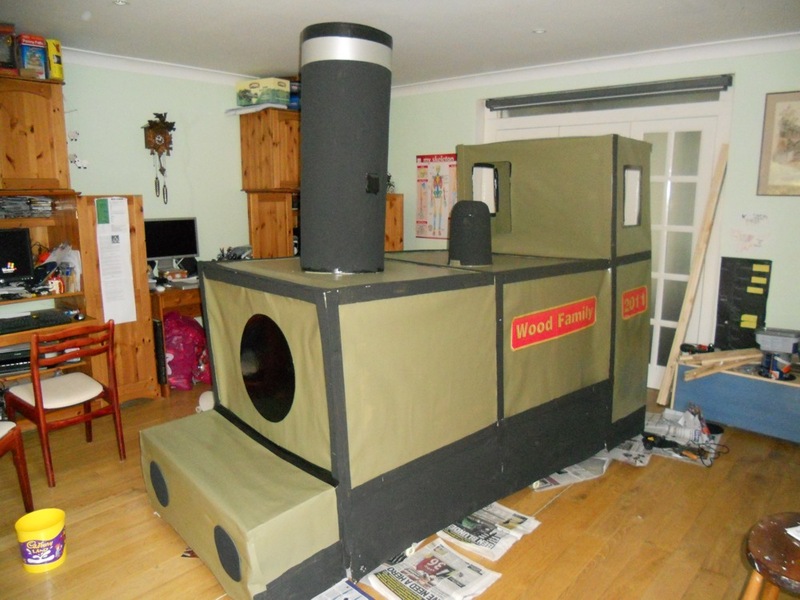 Not completely full-size, as Joshua’s only 8 and needs to be able to get inside it and move it around the roads. 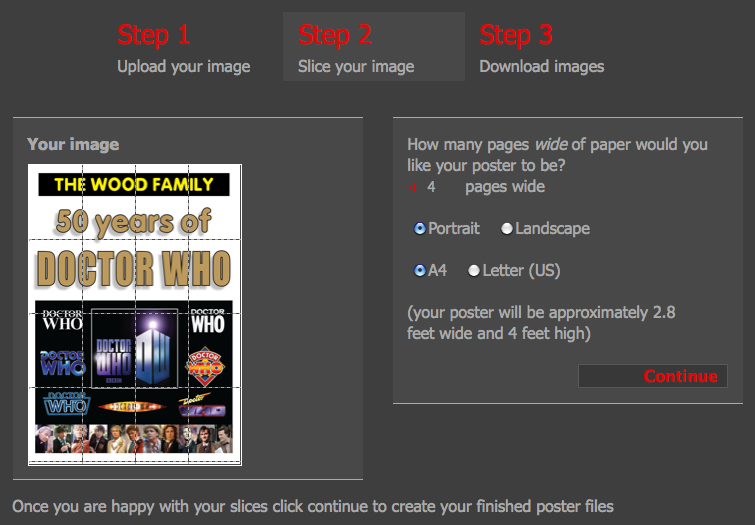 Head is far to complex to create (I looked at some of the many dalek-building websites and it’s scary. Had a brainwave and successfully bid for a voice-changing dalek helmet… monitored eBay for a while until one came up at a snip. Got it for just £1.20. Will be able to build the dalek around that when I receive it. 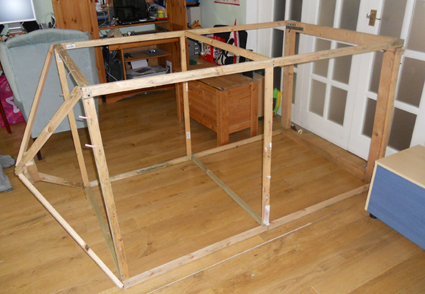 Got loads of strips of 2″x1″ timber and screws for the basic frame. 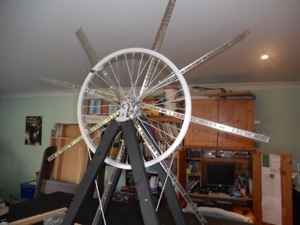 Will need to sort out the base and find wheels/casters. Base needs to be very solid. I’ve got a blue flashing light from somewhere for the top already (don’t tell Berkshire Police). 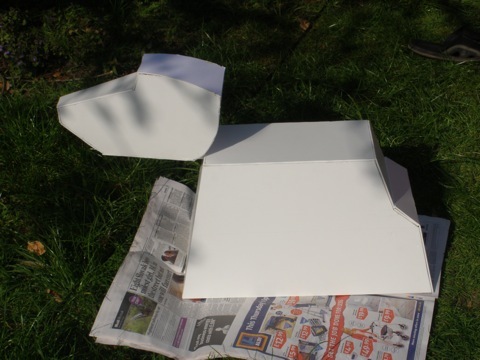 Went to Brilliant Spelthorne Resource Centre and picked up some fantastic canvas on a roll to cover the frame with. 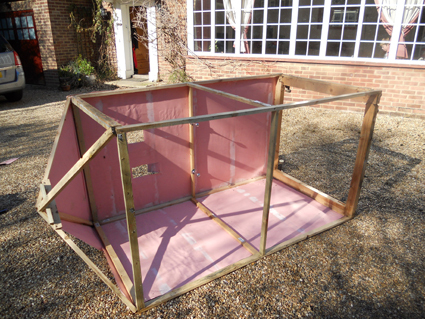 It’s pale pink so might look a bit effeminate so will paint it tardis blue eventually. Got a free 5 litre tin of white paint from there to do an undercoat. Postscript: Paint tin fell off shelf in garage onto floor so now have 2.5 litres and a white garage floor! I will need to sort out an old R/C car for the base of this. 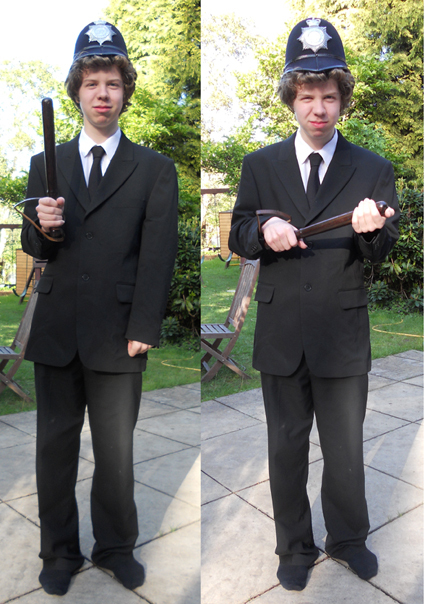 Found a suit to fit Daniel on eBay for a couple of quid.. looks great! Tim’s now growing his hair long for this – although it looks messily perfect today, to be honest. We will need to find a hat though… probably got one in my collection of about 100 hats! Emma has decided to knit an authentic scarf and found a website with a pattern for the original scarf. Collected lots of free wool from the resource centre and bought a couple of rolls to get all the right colours. Oliver did the maths and worked out Emma needs to knit about 20 rows A DAY from now to get it finished by the carnival in June! Found a dark brown blazer in the loft that may do for a jacket. My hair is a similar ‘pale fair’ colour, but much, much less, so I guess I’ll need to track down a white curly wig from somewhere. Went into the loft and found I had a 1970’s prurple dress shirts with very frilly front – I knew it’d come in handy one day! I also came across a purple dinner jacket with very wide lapels, and matching trousers (no lapels) – may be perfect… might add a ribbon stripe as below to set it off. Emma’s been researching this. 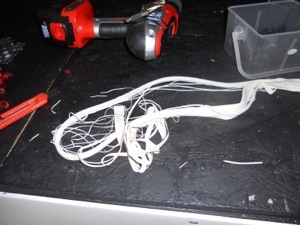 We have material to make it but it may take ages and look a bit rubbish. 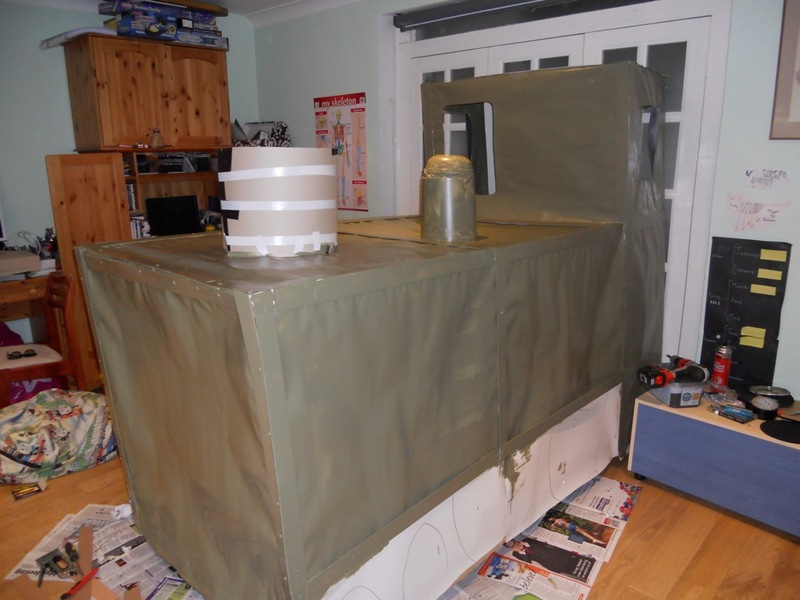 Plan B is to get a suitable dress off eBay for a few quid and spray paint it grey – paint may flake off though and spray paint is pricey! We went for plan C which was to buy an outfit off our friend eBay for a few pounds (can resell after the carnival if we want! )… Wig not included but a friend has said we can borrow something similar off her. 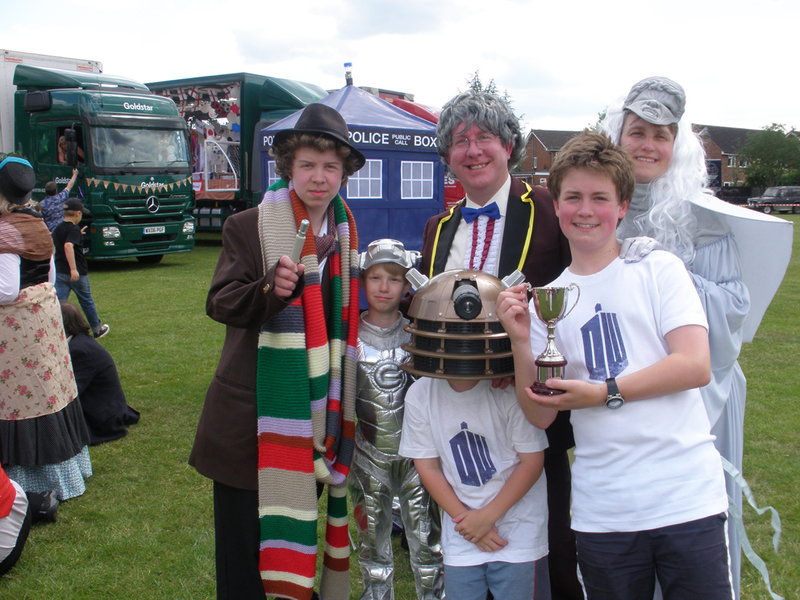 Easter break this weekend so Tardis will be started – watch this space! Busy Easter weekend, but took the odd hour here and there to build the tardis. Really pleased with how it’s looking, and even with the skirt it glides brilliantly – should make it over the road humps okay. 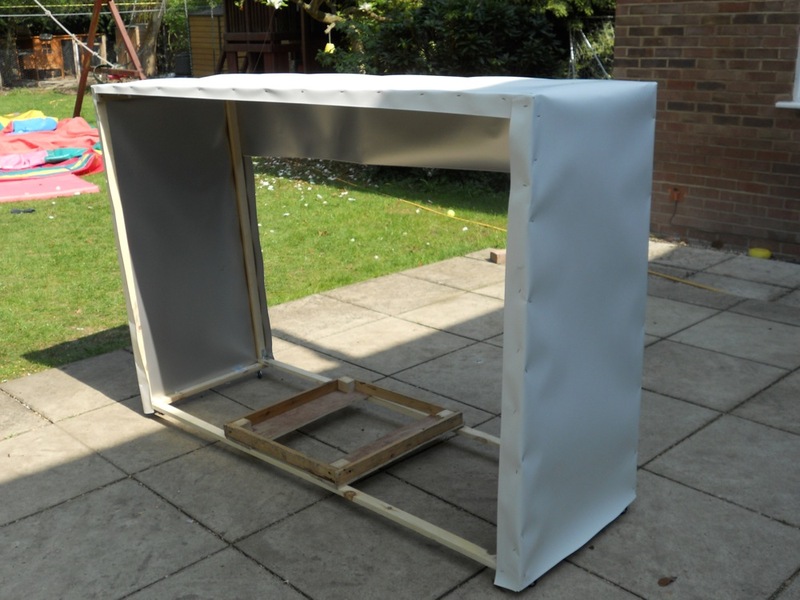 As it’s thin timber and canvas, it’s surprisingly light! Can’t fit the light on the top yet as it’s too big… Emma helpfully pointed out that it’s actually too big to go through the house to get it out. Fortunately we can take it a different route and through two sets of double-doors on its side and get it out of the front of the house (not through the front door though – too narrow!). May have to do the light on the morning of the carnival! Sorted out the artwork for the signage, including the windows. Watched Dr Who new series on Saturday (v. good) – pleased to see they haven’t made the tardis pink. Spotted there’s now a St John Ambulance logo on the door so will have to sort that. Will also have to cut a flap for Ollie to get in and out, plus cut a window for him to see out. Keeping an eye on eBay for large K90 r/c models… they’ve still a bit small so will probably build one. Tim had his hair trimmed a bit so it’ll grow and be optimum for the carnival – don’t want to leave it too late or he’ll look more like a Dulux Dog. Emma’s still motoring with 20 rows minimum a day on the scarf. Should’ve taken it to church as the vicar rambled on for hours on sunday and she could’ve done 100 rows! Costume needs a bit more work. Maybe this weekend’s project! Tried on the shirt – bah… collar size far too small for me (2 sizes).. will see if Emma can do anything! Bought a white curly wig off eBay for a quid – should be able to trim it to look unlike an albino clown. Yay! 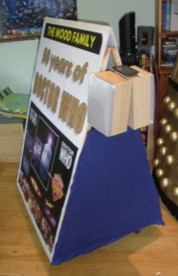 – just about finished the Tardis! Cut a small hole in a window for Ollie to see out of when he steers it. Also have to cut a door/hatch in the back so he’s not trapped in there (Carnival fire/health & safety regulations I believe). 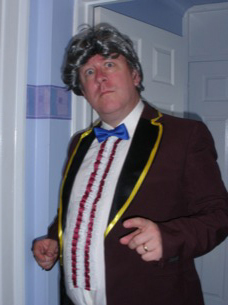 Found a lovely silk cravat on Ebay for 99p for TOM BAKER outfit. Found a perfect Fedora hat in the store room that just needs a bit of a clean. My dad used to wear it so it was obviously the height of fashion in the 70s. Nearly there now on that one. Scarf doing well – Emma’s got it up to about 1m now! Found some wheels in the store room last night! 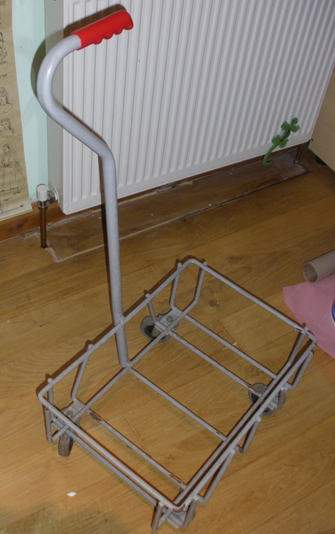 It was one of the many things I rescued from Woolworths (RIP) – a shopping basket holder (I also have the 40 baskets it held!). The casters look like they unbolt easily and will bolt onto whatever base I construct the Dalek from. That’s this Sunday’s time filling activity! Solved the problem of the frilly shirt being far too small for me… Replacement shirts are over £12 so that’s a no-go… currently winning a frilly front to go on any plain shirt for 99p… Quietly confident of winning it as there are a few up there at present getting no bids. Can’t think why. Will need to affix weapons – I’ve got a sink plunger ready, plus a tube which I want to make into a weapon from the early series that squirted spray gas or something. Found a product from Maplin which is a sort of spray smoke for use in discos. Joshua will hopefully be able to operate it from inside and annoy people. 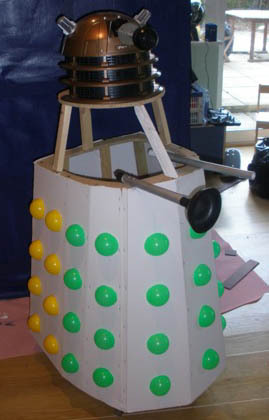 That’ll be fun, trying to rig it up so the spray goes OUTSIDE the dalek! I think I’ll try using ball-pit balls cut in half for the bobbles – I need about 40 so don’t want to pay for anything (we’ve hundreds in the loft!). 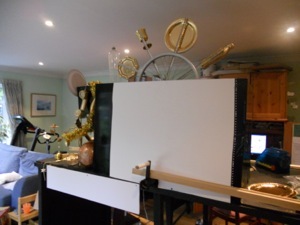 Had a profitable weekend on Ebay and sold old rubbish to the value of just under £50, so plenty of cash in the account to pay for metallic paint. JON PERTWEE: I won the ruffle by the way for 99p! K9: Found an old Jeep r/c car on which I’ll build K9. Challenge will be to keep it extremely lightweight, or it won’t be able to propel the beast! Productive weekend in between family outings… lovely to do the float work in the garden while the sun is out, boys playing, chickens popping out eggs and the sky free from planes! Found the old ball-pit balls in the loft. Emma and I carefully cut them all in half with a hot knife and hotglued them onto the body of the dalek. They look pretty good and are the right size! Added vertical strips from card below the helmet and covered with pink canvas. Then used Hammerite Gold paint I found cheap in homebase – coverage was excellent and covered the plastic balls really well. 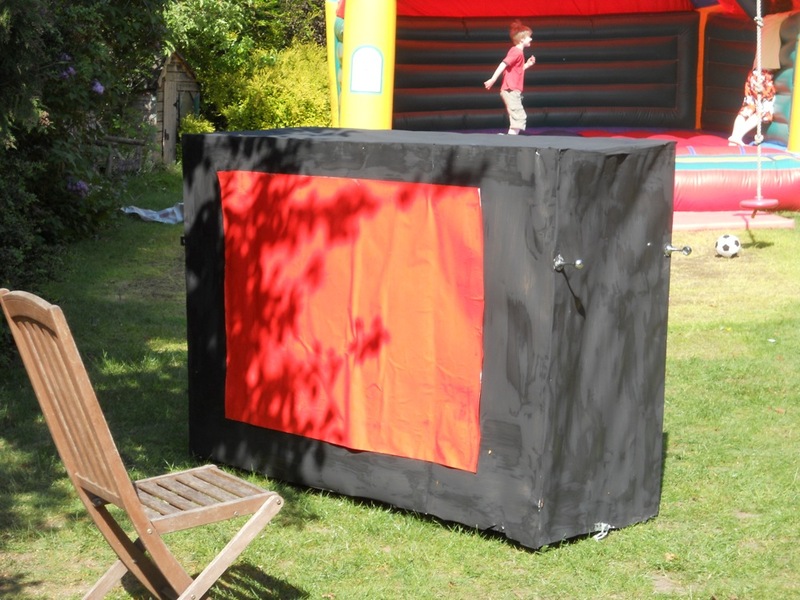 Close inspection shows some lumps and runs, but it’s a theatrical prop so designed to be viewed from a distance! 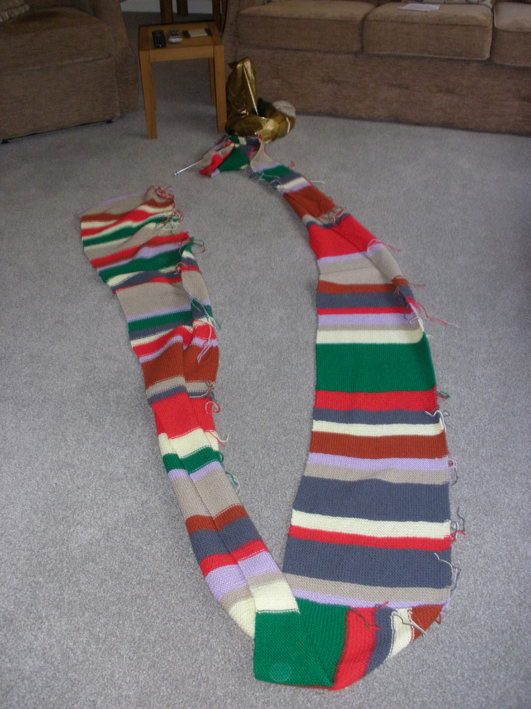 Tom Baker’s scarf: Emma’s now up to about 6ft in length… a third of the way there! Decided to use plastic ‘Foamex’ sheets for the frame. Cardboard is easy to damage… I had some old signs made from Foamex I rescued from the skip at work a while back and set to work upscaling measurements from a 3″ version one of the boys had. It actually went really well and problem-free. Had a minor worry about how to connect the head to the body but solved it using a simple cantilever system. 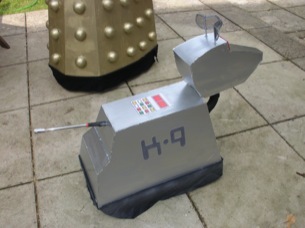 I’ll need to add all of the detailing, ‘K9’ sign, radar ears, telescopic tail, computer panel on back etc, but this is fairly simple and fun to do! Found some old silver spray paint in the garage… will need a few coats. It sits on the r/c car really well – I’ll hotglue it on to the car and add a black fabric skirt when I’ve done all the details. They all look pretty good together in the back room… Will get the tardis out next weekend and sort out the light on the top. (I’ve added door handles and a Yale keyhole… although had to move this twice on Emma’s instructions as it wasn’t exactly in the right position!). 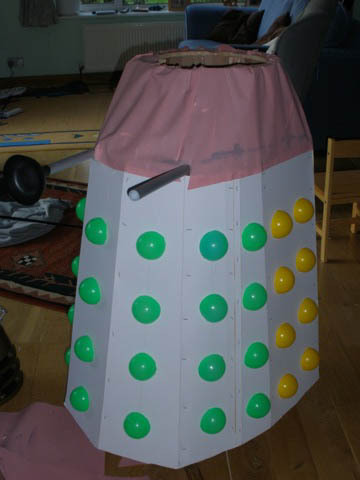 Added a black skirt to the dalek to hide the wheels – sets it off quite well I think! 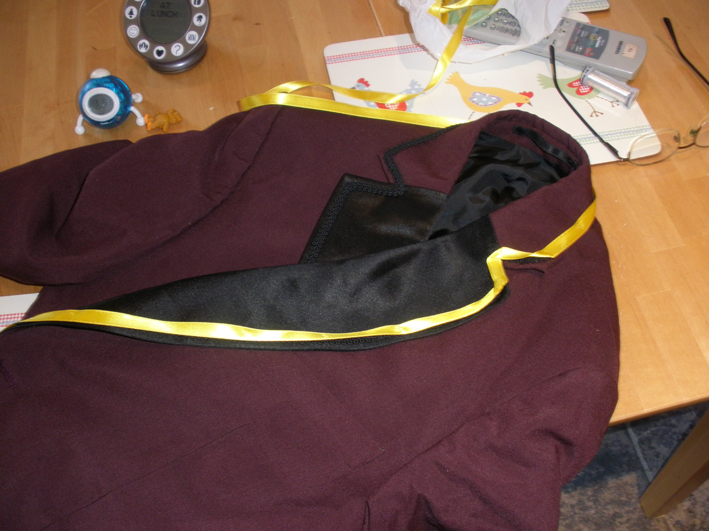 Need to do gold rivets on the panels around the shoulder – might find some round gold stickers for this. 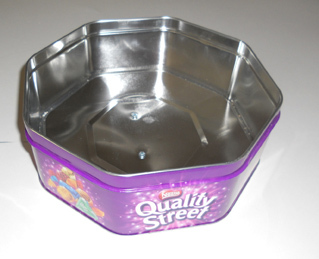 By the way, the Magican spray is as effective as a sparrow’s fart so have tracked down some indoor ‘safe’ roman candle cake firework fountains that may be good – they last a minute each … I found a rival auction site to Ebay where I picked up a bulk box of 48 for a tenner… we shall see! Otherwise, our birthday cakes will be lively for the next few years (or I’ll use all 48 on my cake next March!). 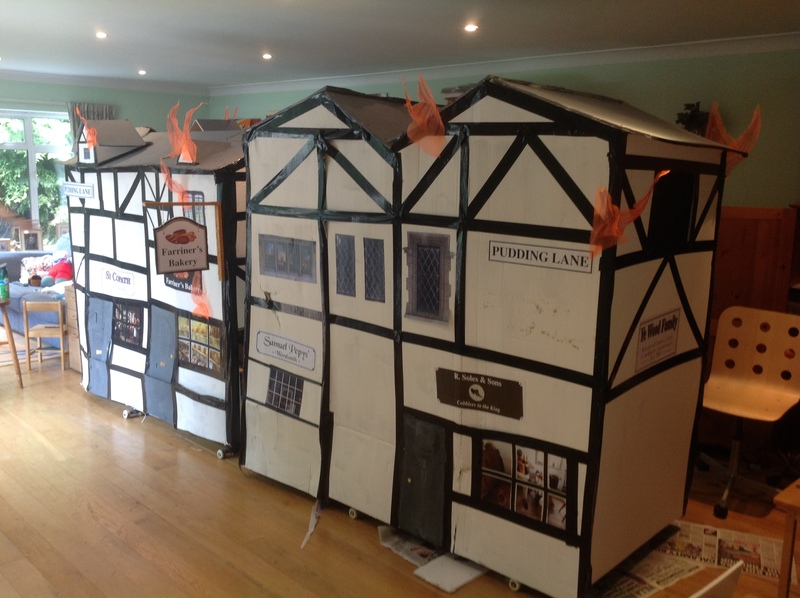 Emma muttered something about wondering what it would be like to get our back room back… although she then said she couldn’t bear to see me dismantle these three items after the carnival – wonder if the boys could use them for world Book Day costumes next year? 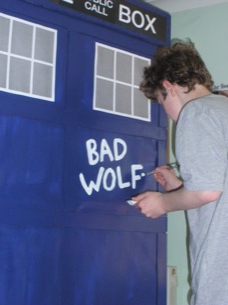 I’m sure the teachers would love Daniel rolling up in the Tardis. They may not be so keen on Joshua’s firework-blasting Dalek though. H&S etc. Have to complete K9 next… then it’s onto my trailer with the display boards and sound system. The roman candles arrived today… 48 of the little beauties! They allegedly each last for up to 1 minute each and emit a shower of flame and sparks 50cm-1m. I will test one in the (plastic!) weapon tube this weekend without Joshua in the Dalek and see what happens. Need to block the back (inside) end of the weapon tube otherwise when I ignite it, it will possibly shoot inside and impale Joshua which is possibly not a good thing. Will need to ensure lit end sticks proud of the tube to avoid it melting, but it’s great John Guest tubing designed for hot water systems so is pretty robust and heatproof. We shall see. Will need to sort out a double bucket system in my trolley to hold used and unused candles separately. The packet does say they are ‘safe indoor fireworks’. Not quite sure how a firework that ’emits shower of sparks and flames up to 1m, for up to 1 minute’ can be deemed safe indoors but, hey ho. Fortunately, we’ve just heard that the police are refusing to accompany the procession and shut the roads for financial reasons, causing the committee to fork out £2,000 for a private firm to do the job. I say fortunately, as there’ll be less chance of me being arrested for letting off fireworks in a public place if the police aren’t going to be there. 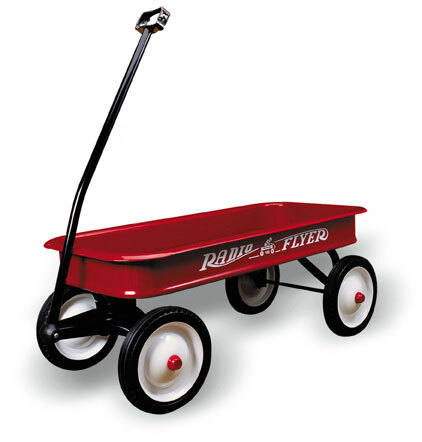 Started thinking about the signboard saying what the float is called… Going to use our Radio Flyer trolley and mount an A-Board on – It’s about 3ft long so should do the job. Storage for drinks, spare/used roman candles etc. It will be pulled by Jon Pertwee (Dave). 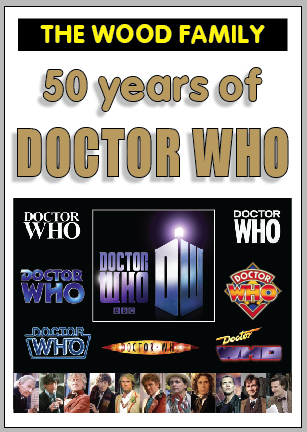 The sign was easy to do and features all the Dr Who logos, and each of the Doctors over the past 50 years (alright, 48 years, to be precise – hope we don’t get disqualified on that technicality). That’s a bit small on A4, so visited fave site http://www.blockposters.com (remember them from last year’s von Trapp kids?) and instantly got it blown up for free to the required 3ft x 4ft. 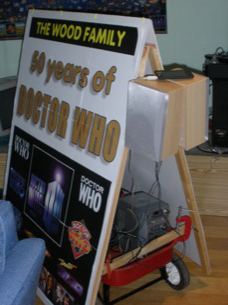 Now I just have to mount it on the boards and affix the boards to the Radio Flyer… Easy weekend job, in between finishing off K9 and attending St George’s Day parade… Wonder if they’d like the Tardis and Dalek to make a special preview attendance? Perhaps not. K9: Found an old wire mesh pencil holder and simply cut out radar shapes to form K9’s ears. Covered edges in silver Duck Tape – close up looks a bit rough but a couple of metres away and it’s fine – it’s a theatre prop remember, not a work of art (I keep reminding myself). Painted the body silver then Added some details, including the correct panel and K.9 decals. I’m using a telescopic magnetic grabber/torch thing for the tail. I simply drilled a hole in the body and wedged it in. Perfect! 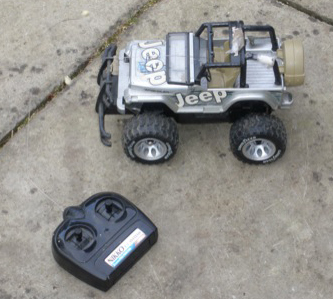 Had a major problem when I tested it – the Jeep car was too feeble to power it. Even though it’s quite light the Jeep stood still – AAAAARRRGGGHHHH – it’s not powerful enough. Don’t relish the prospect of Tim walking it with a lead so trawled the boys’ rooms for a more powerful car. 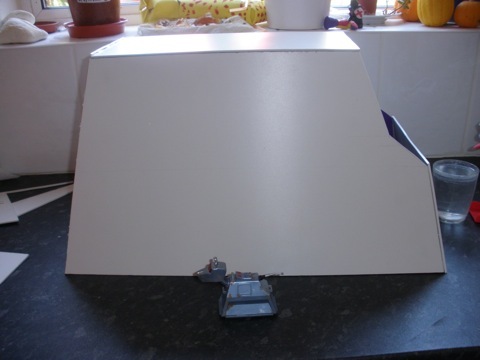 Tim had one that he’d converted to a Robot Wars robot a few years ago, so he de-converted it. 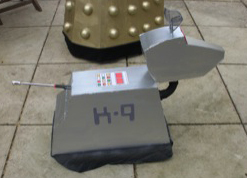 I had to re-cut the mounting hole under K9 to fit but it works really well. I added a black skirt to hide the wheels, and sprayed it silver to give it a sort of ethereal quality, although it looks a bit like black material sprayed silverish, truth be told. It’s a theatre prop, okay. 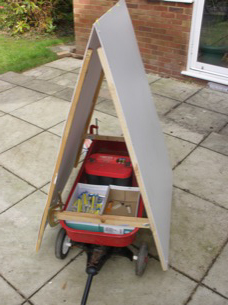 Signboard: Found the foamex panels from a few years ago and quickly mounted them onto an A-frame which was then clamped to the Radio Flyer. There’s a box of roman candles, plus a box for used candles at the front. At the back is the car battery and power inverter, and then the sound system will be fitted, run by the iPod containing lots of different versions of the Dr Who theme that Tim’s collected. I’ll put in some black material to cover the insides. Our drinks/snacks will also live in there. 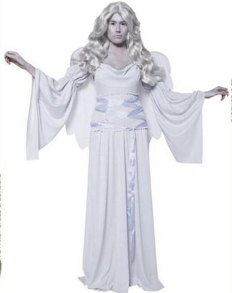 Emma as a Weeping Angel (who starred in Saturday’s TV episode!) 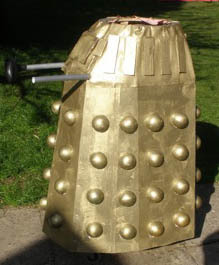 is going to pull it, as I need to be free to light the fireworks and help direct the Tardis and Dalek if needed. I’ll pop the signage on in a spare moment this week. DALEK: Those roman candles are great… tested them with Joshua steeering and moving the head about and talking through the voice changer… the video doesn’t do it credit… the roman candles last for over a minute and are stunning! 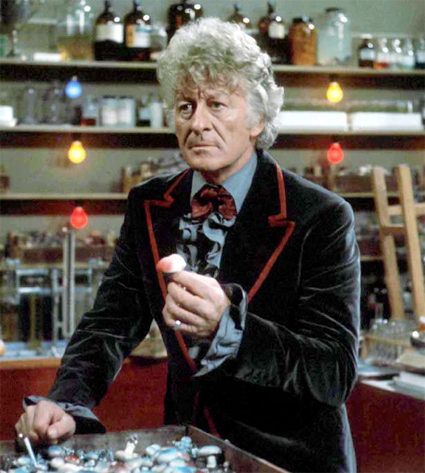 Decided that the white curly haired wig for Jon Pertwee would make me look more like an albino clown so have sourced a ‘grey Casanova 1970’s wig’ which looks much closer to the JP look I was after. Emma’s found a great pair of long grey gloves on eBay for a couple of pounds that will mean she won’t have to wear grey bodypaint on her arms. I’ll post pics here when they all arrive. My crocodile clips to connect the inverter to the battery have yet to arrive… supplier may have been dodgy… we shall see. 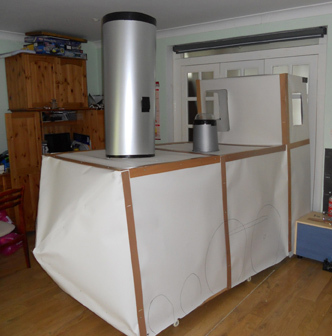 Had friends over on Monday and they inspected the items… the Tardis can fit four children inside it so must be bigger on the inside than on the outside. Ventilation holes were a good idea as it got a bit whiffy in there I believe. Big problem though – I’ve put the steering handles on the wrong side of the inside so Ollie won’t be able to steer it unless he walks backwards. Baring in mind it’ll be almost impossible to steer it going forwards I’d better get in there and relocate them. Crocodile clips on way. Supplier blamed volcanic ash for the delay in posting them from his warehouse in Wantage. 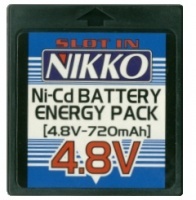 Discovered that replacement batteries in our local toy shop are £20 each – yikes! Mind you, a swift search on the internet and I found them for £2 each, plus 50p delivery! So I bought 2. No wonder High Street shops are suffering! Did some sewing, as Emma seems to be a bit pre-occupied with knitting the scarf and it possibly wouldn’t have been too tactful to ask her to do it (what with the perpetual sewing-in of names in socks and of badges on Cub sweatshirts…). Some yellow ribbon tacked with invisible thread (took me ages to find it) brightens up my purple DJ and makes it look vaguely like the sort Jon Pertwee wore. Not much to do on the float… managed to sort out a nifty little holder that is screwed to the top of the Tardis for the light. The Camping lamp (£2.5 bargain!) slots into it snugly. 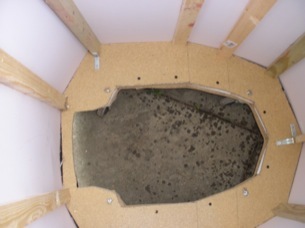 A SprayMount lid cut up provides a passable blue top for it. Put Tardis on its side and moved the handles to the front from where I’d put them… seeing my handy annotation when I built it, I’m not sure why I screwed them on the wrong side… ho hum. Jon Pertwee: My Cassanova grey wig arrived – perfect! Weeping Angel: Emma’s grey elbow-length gloves arrived – perfect! She now needs a grey polo neck top so she doesn’t have to put grey facepaint on her neck. 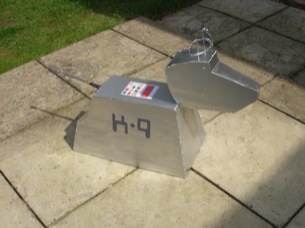 K9: Those batteries arrived – the perfect items. Much more charge than the old two I had. I will ensure all four are fully charge – hopefully K9 will cope with the bumpy road and those four batteries will be enough, or else Tim will be carrying her! Check out the new video of K9 in action here. Nothing much to report as I seem to have complete most of it ahead of schedule! Still waiting for the clips to connect the battery to the inverter, but the supplier is posting them today apparently and letting me keep the wrongly supplied leads. Will eBay those and hopefully get enough to cover the cost of the proper leads! Emma’s doing so well with the scarf… must be about 11ft long… she’s got about 3ft or so left to do. Am planning to do a mass rehearsal over bank holiday weekend, trying on all the costumes and getting everyone to practice driving/walking etc along our lane to see if it all holds together okay. 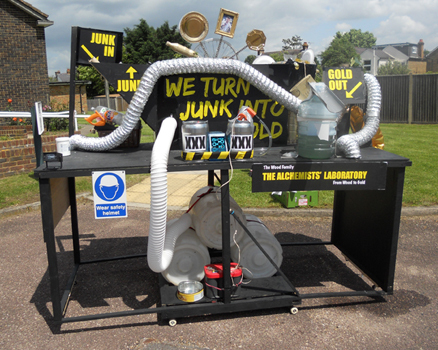 Thanks for all the lovely comments – this blog’s getting about 20 visits a day for some reason, hopefully not all from rival float builders in the village! 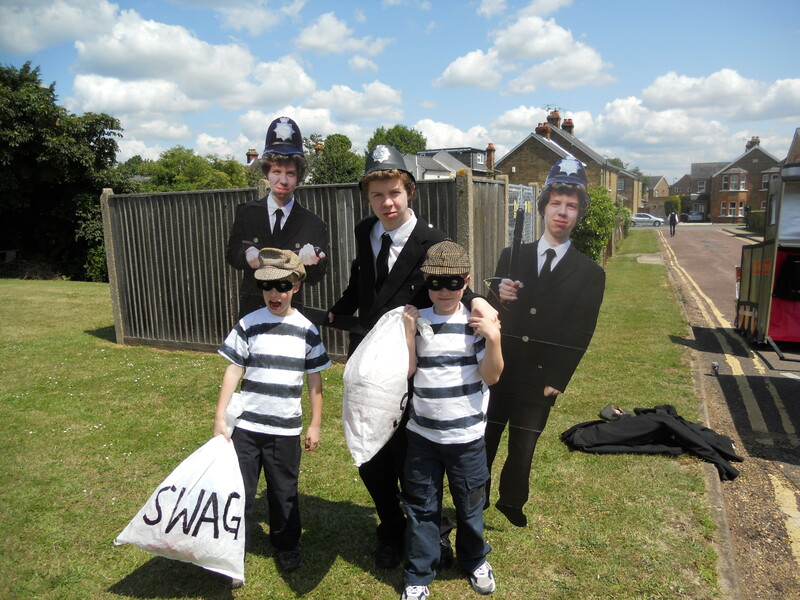 By the way, the procession takes place on SATURDAY 12th JUNE (the day after J&D’s birthdays). Crocodile clips for power source still not arrived. Supplier says they posted them a week ago. Yeah, right. Not panicking just yet but must get them by this weekend so I can set up and test the sound system. Everything else is complete… except the scarf has another couple of feet to go – Emma’s confident of completing it by Saturday, then a couple of days of sewing in the loose ends. Her mum says it’s too long and she should stop, but then it wouldn’t be authentic! I think she’s jealous ‘cos Emma didn’t accept her offer to help with the knitting! 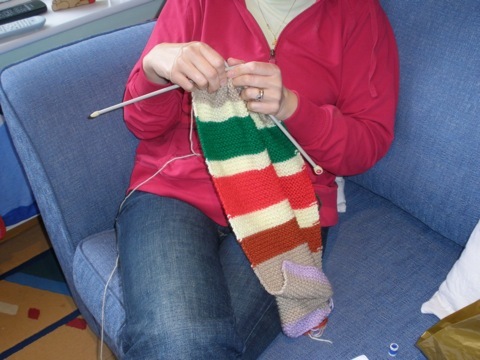 Emma’s resisted taking it into work and knitting while invigilating for the SATs! Bank Holiday tomorrow, so hopefully will take it all for a spin up and down the lane and try on the costumes. The crocodile clips finally arrived. I wired up the inverter and tested different music systems – found an old hi-fi in the loft with a line in socket, and the iPod plugs in perfectly. 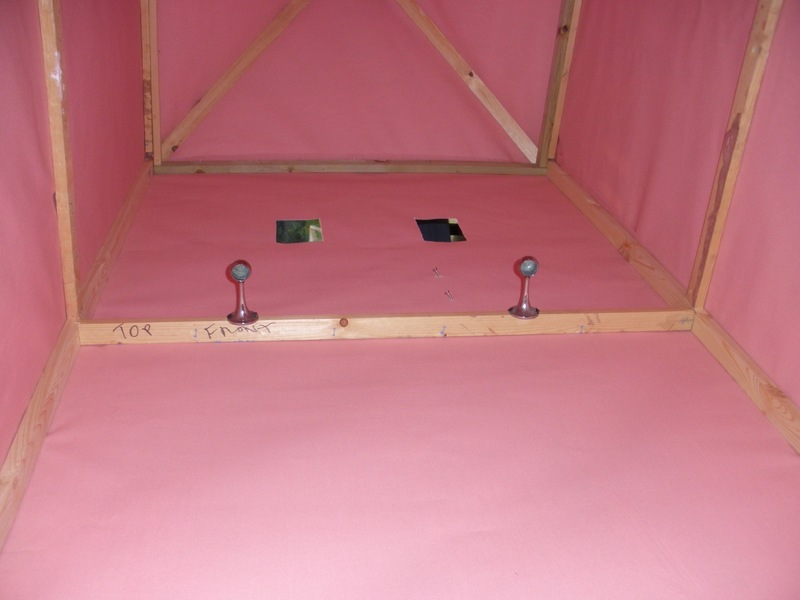 Covered the triangular gaps with blue cloth and mounted the speakers securely. Need to swap things round so that I can access the roman candles from the rear, as Emma will be pulling this. 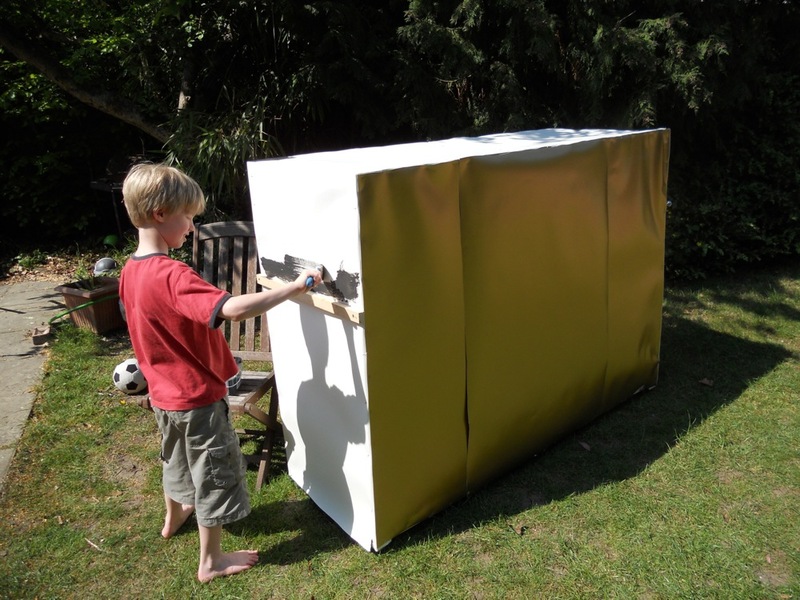 Hoping to get the Tardis to materialise in New Zealand after the carnival, so the boys’ cousin, Harry White, can play with it as he’s a major Dr Who fan… perhaps their grandparents can smuggle it in the luggage when the next visit! 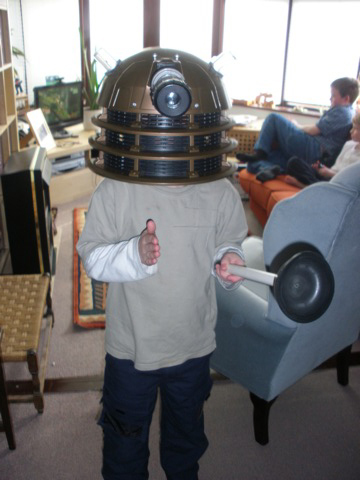 Tested the Dalek.. but Joshua had trouble walking as there wasn’t room for his feet to move properly! Solved this by cutting away some of the base to save his ankles getting caught. Much better! Hope the neighbours enjoyed seeing him scoot down the lane! 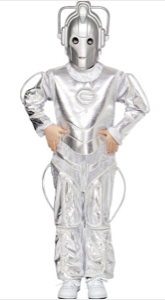 We tried on the other costumes… here’s Daniel the Cyberman! 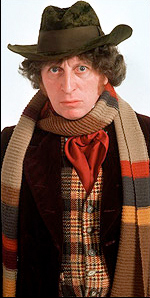 Tom Baker will be very warm in his lovely scarf! 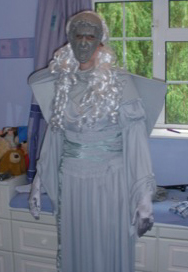 Yes, that’s Emma as a scary Weeping Angel! Jon Pertwee’s let himself go a bit, but should be passable! Decided that on past years’ experience, lighting bangers etc with a cigarette lighter is awkward, and the flame keeps blowing out. Experimented with my chef’s blowtorch and it’s really good. Doesn’t look right though, so trawled eBay and picked up one that looks like a sonic screwdriver for a few quid… Perfect! 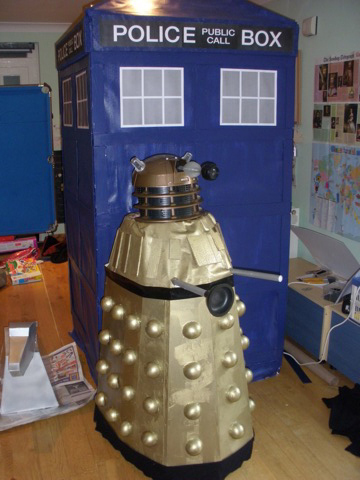 Will be test driving the Tardis this weekend – couldn’t be bothered to rearrange the house to get it out last weekend! Sonic screwdriver arrived – lovely piece of kit, and looks just like a sonic screwdriver, but no self-ignition so I would need a lighter… unsure whether to actually use this on the day or my self-igniting chef’s torch… Anything to make the operation easy and simple to hold, like me. Took the Tardis for a trip down our lane. Had minor problem when front skirting got trapped under front wheels and it nearly tipped over. Swift bit of trimming and it goes a treat! 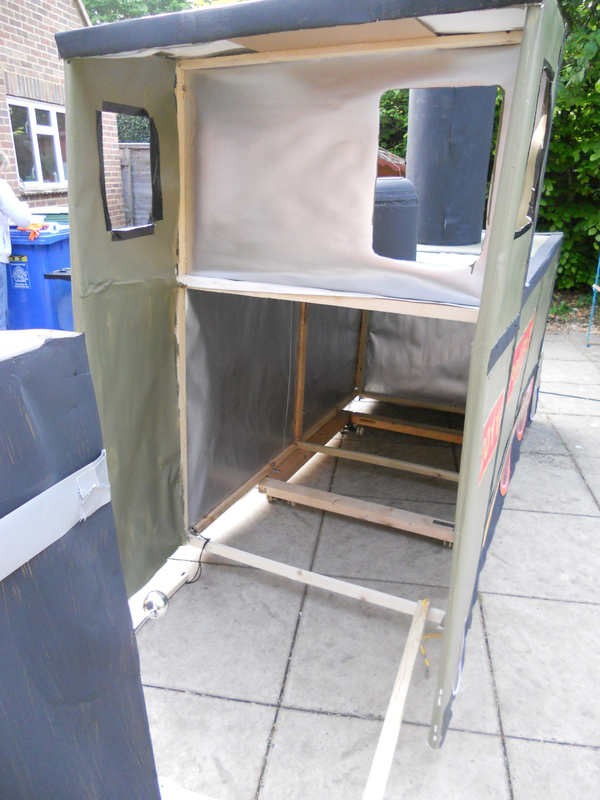 Oliver DID get very hot inside though, and is unable to hear our useful instructions on steering… Cut another window hole at the back to allow some passing through of fresh air/instructions. Will install a fan in there for him on Saturday to save him overheating. Will also install ice-filled water thing in there for him to prevent getting dehydrated. There’s loads of space inside for all this (it’s a Tardis, see). 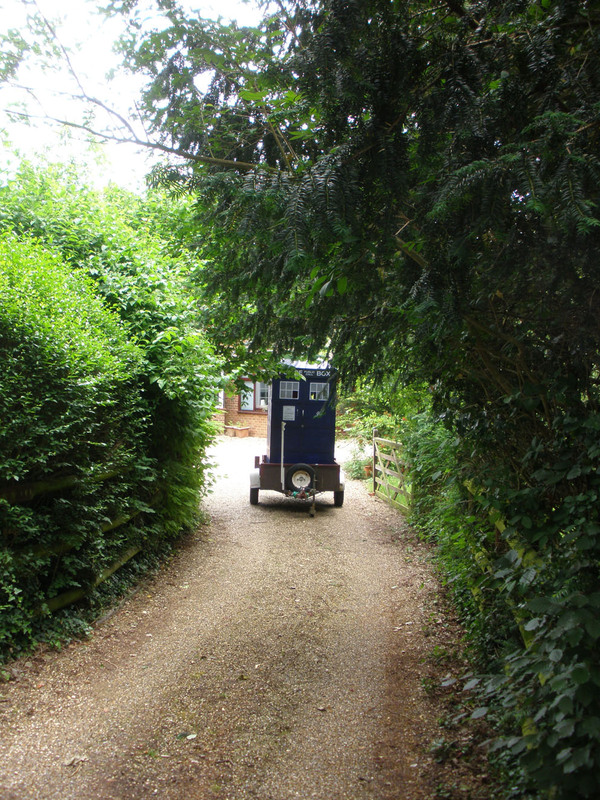 CLICK HERE TO SEE THE TARDIS MOVING DOWN THE LANE. 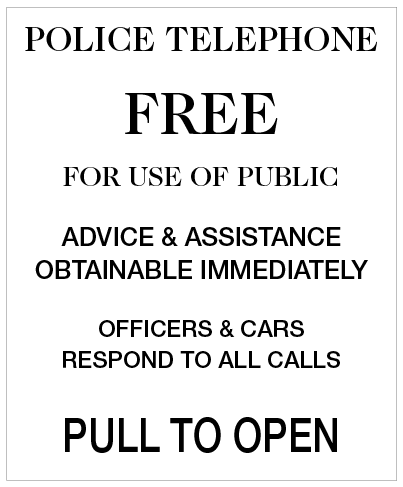 During the trials, our neighbour arrived in the Lane in their car with a friend – the friend was rather surprised to see a Tardis nipping along. Needless to say, the neighbour took it in her stride and just said that when you live next door to us you sort of expect this sort of thing. Swapped the board on the trolley around so I can access roman candle supplies okay. 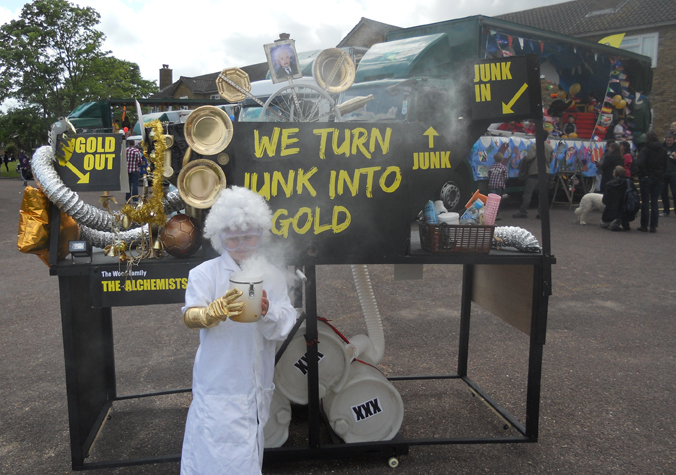 SATURDAY 12th JUNE – CARNIVAL DAY! The day is here! We feel pretty prepared so I loaded up the trailer just to make sure everything fitted in it. Popped the Dalek inside the Tardis (there’s so much space inside there!) and the trolley at the back. Perfect. Room in it too for Emma to sit and hold it all from toppling over on the road humps. Decided to check that it would fit down our drive. Got out the pruning shears and did some serious branch lopping! Glad I checked! 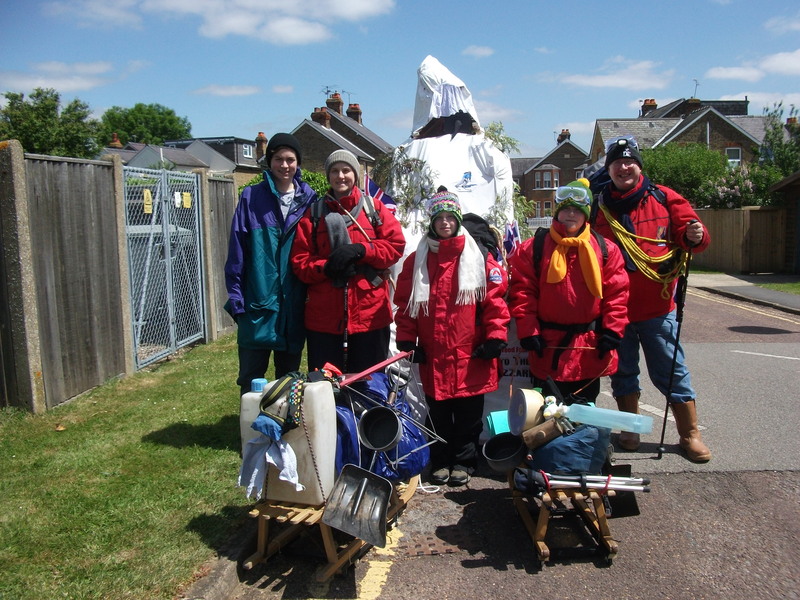 We got dressed into our costumes at noon and set off to the start point. We decided to get there early in case we needed to make any repairs. Also, it meant we could have a picnic on the grass and be calm and ready. Also, it meant we would be ready as people drifted in, rather than them seeing us arrive and unload -= I like to present the whole thing as a finished set piece! Emma sat in the trailer with her phone on, and ours on loudspeaker so we could her screaming at me to keep below 10 mph for some reason. Unloaded everyone then nipped home for blue Tardis paint to touch up some damage caused either by it rubbing against the trailer frame, or Emma gnawing at it in sheer panic. Also picked up a gluestick to repair some lifting artwork from the boards. All ready and loads of people kept coming up to check us out. 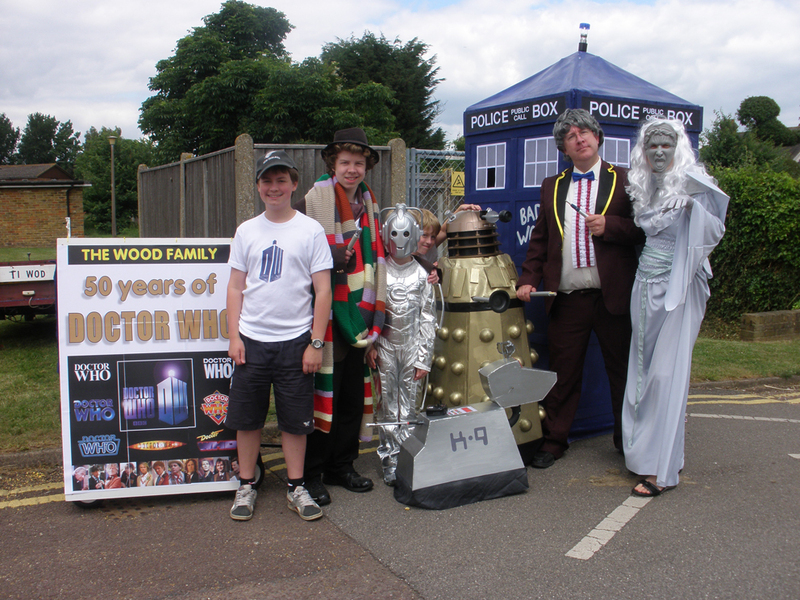 Lots of local kids had their photographs taken by the Tardis! Discovered that Tim was extremely popular – a real natural. People were amazed at his hair (all real!) 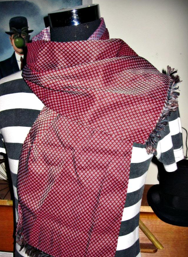 and the scarf drew so many comments and we had a couple of people wanting to buy one from us! Emma’s not so sure about that. 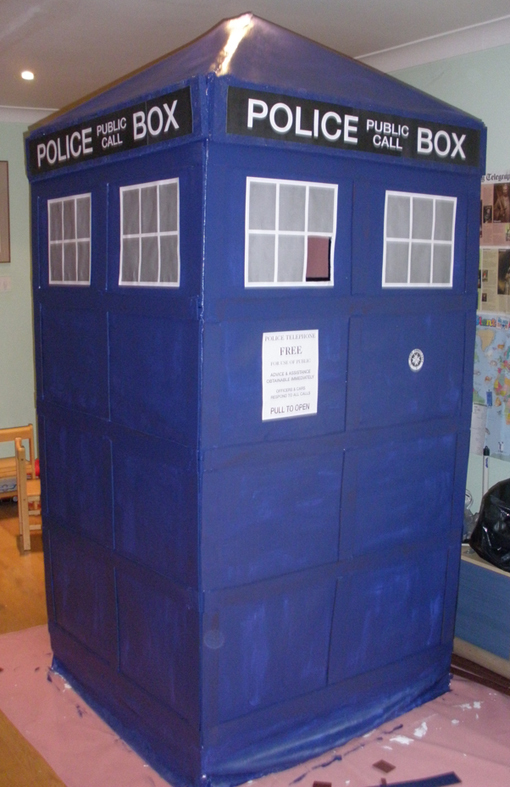 Also had two people wanting to borrow the Tardis for other events and kids’ parties! 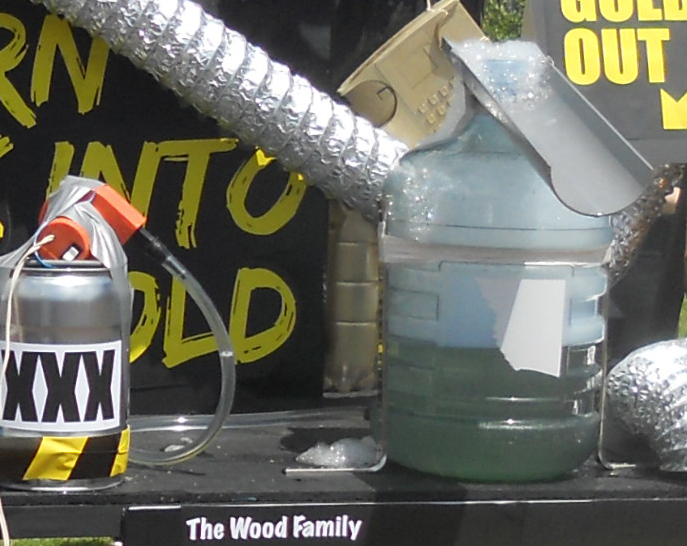 I’m using it at a county Cub Scout Activity Day next weekend so it will at least get a few more outings! 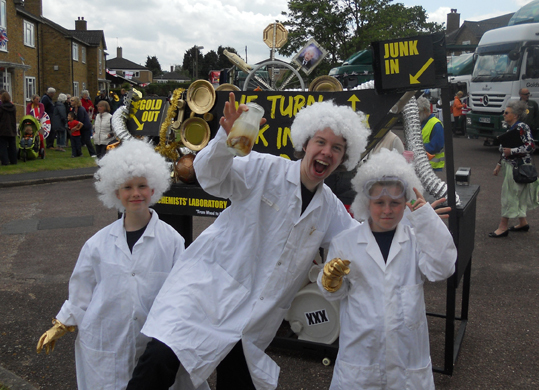 The parade itself was great fun…. until we encountered the wonderful potholes. 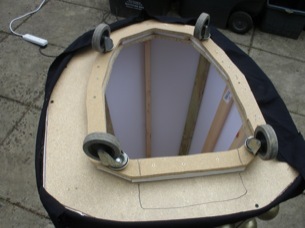 The two back wheels of the Dalek came off – the chipboard mount snapped (remember the one I had to cut away to enable Joshua to walk properly?). We quickly got Joshua out, glowered at the Carnival official who moaned at us for stopping, and proceeded. 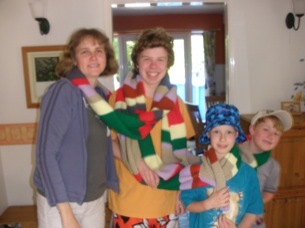 Joshua quickly took on the guise of the ‘Next Doctor’, complete with Sonic Screwdriver (lucky I’d made Dr Who T-shirts for Joshua, Ollie and Daniel, so he looked part of us. ) 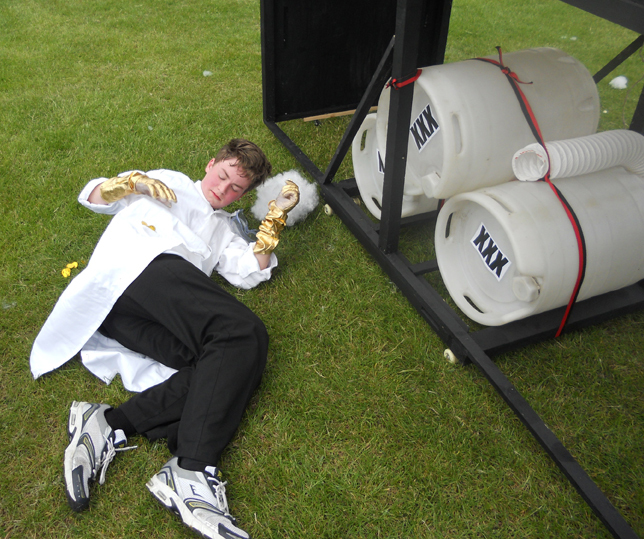 I then had to push the Dalek around, while keeping the fantastic roman candles lit. It looked great I think! With hindsight, We should have kept it as a pushing Dalek, had Joshua as a slitheen or other alien and I could have pushed the Dalek around. The other problem was that, whilst K9 drew gasps from people as Tim directed it around the road, it only managed a top speed of notmuch mph, which was a bit slower than the parade, which moved at abitfaster mph. Tim therefore had to carry K9 for parts of the journey round the village. 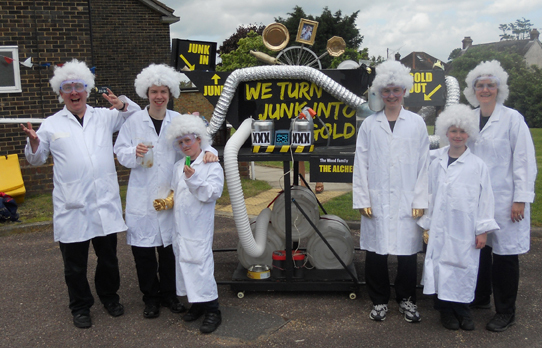 Seeing all our friends around the roads was great and hearing everyone’s comments was brilliant! Emma kept saying hello to named kids from her school but they got scared – I think she forgot she was wearing a mask! After a gruelling, very hot hour’s walk with only one break (more breaks needed next year please, organisers!) we ended up at the Rec. 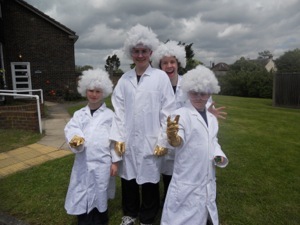 and paraded around, again it was lovely hearing the comments and applause – the boys were in their element! Anyway, the judging had been done (the Lady Mayor was impressed by Emma’s knitting, and was interested in a bespoke one to hang her Mayoral badge on I think! Anyway, we WON THE FAMILY TROPHY FOR THE SECOND YEAR RUNNING! That’s all for this year… I’ll start up this blog again next February probably. Thanks for all your nice comments along the way, it helps keep up our enthusiasm!